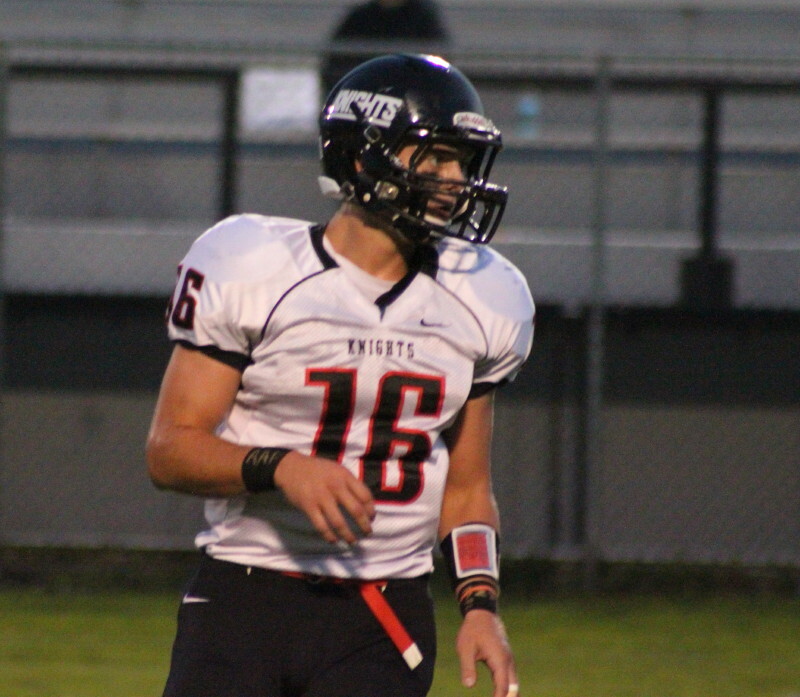 Brandon Walsh (16) passed for two TDs and ran for two. Here blockers Bobby Trickett (55) and Nate Hitchcock (56) give him protection. 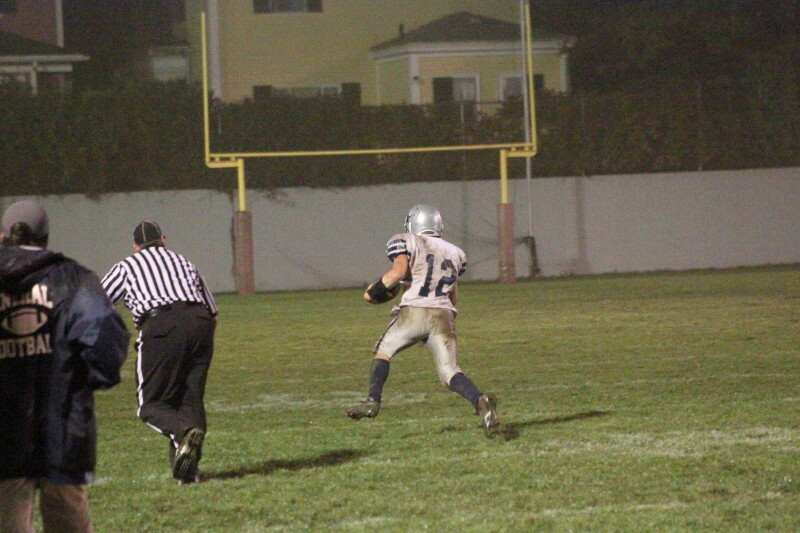 John Iannone scores first NA touchdown. 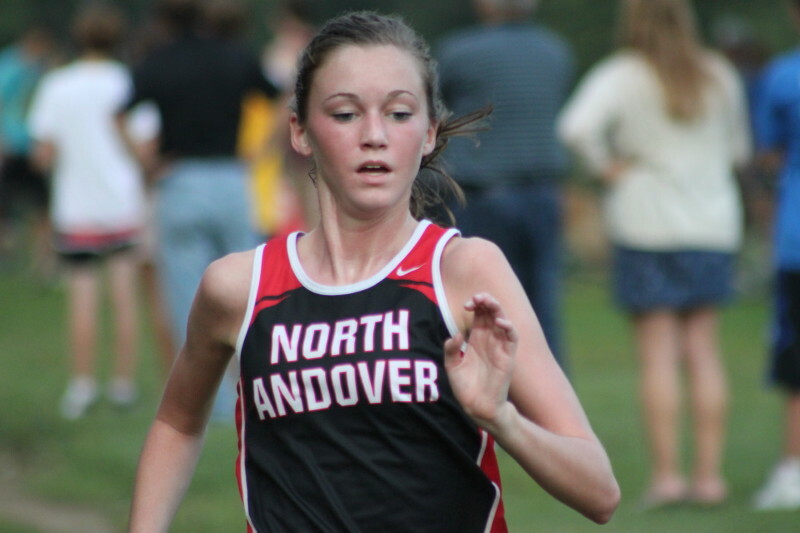 (Newburyport) In non-league Cape Ann League action, North Andover did many things right and easily defeated Newburyport, 34-7, on a beautiful Friday night at World War Stadium. 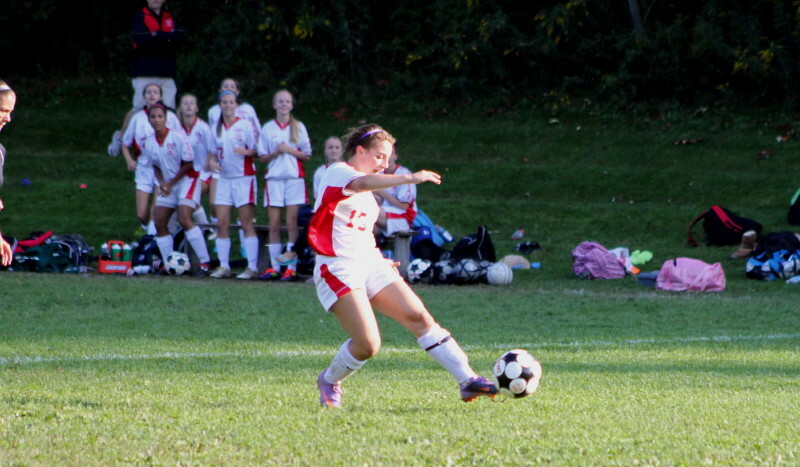 This was D1 North Andover versus D3 Newburyport. 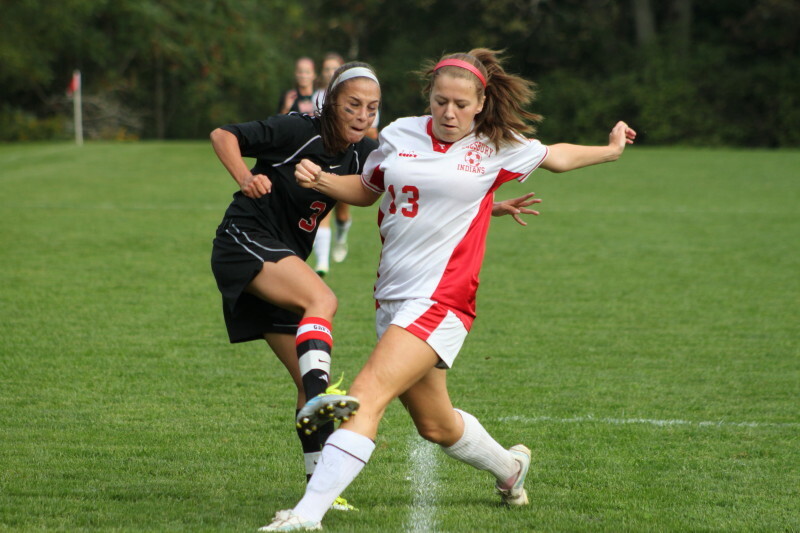 This was also a rematch of teams that had been part of a 40-0 Knight blowout last year. 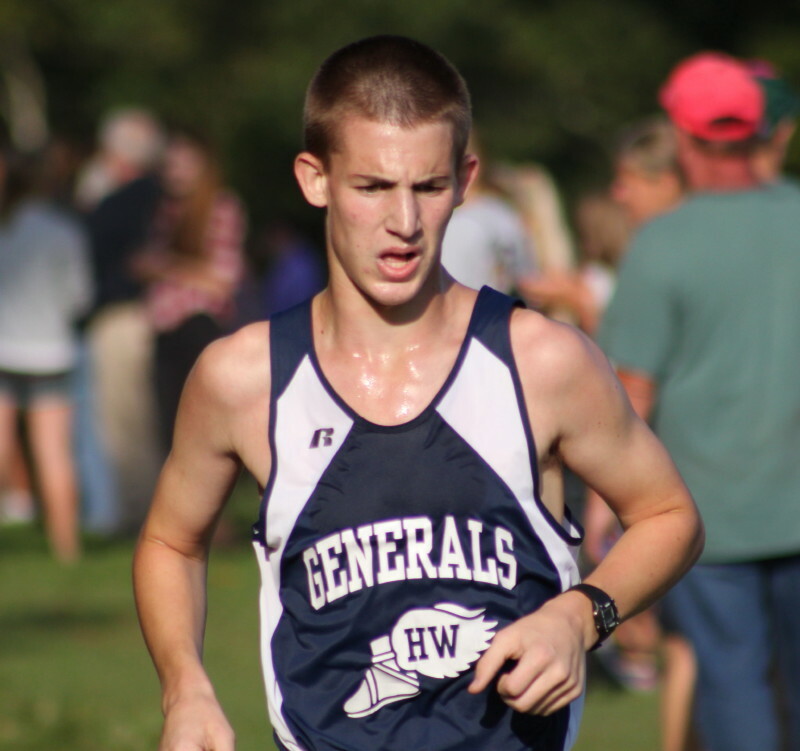 And this was also another year for senior quarterback Brandon Walsh to show why he is one of the best in the state. This didn’t figure to be a close game but on the scoreboard it still was at halftime (13-7) but in the second half the visiting Knights produced scores on their first three possessions while the Clippers came up empty on theirs. Brandon Walsh was good as advertised. NA operated with no huddle and received the plays via hand signals. In Tom Brady fashion, Brandon made changes at the line of scrimmage on many plays. 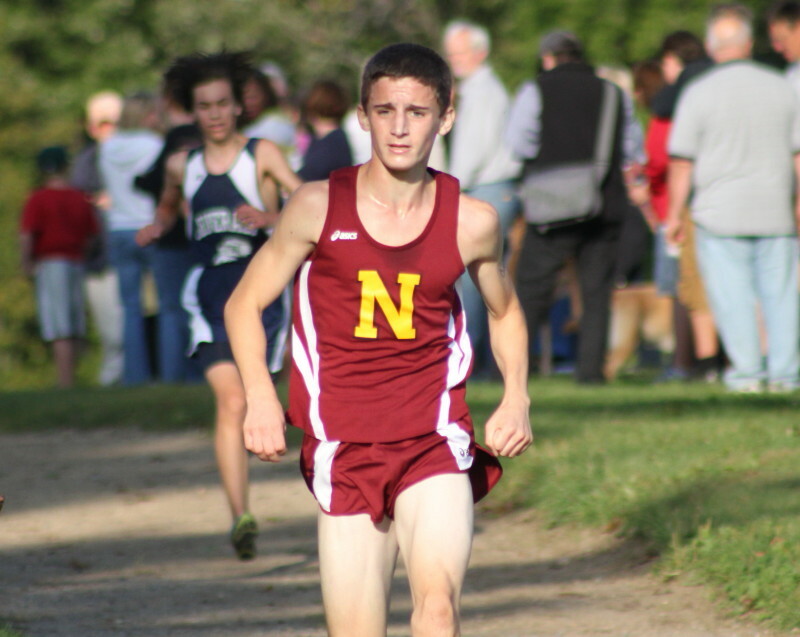 Brandon Walsh (only the six visible in the distance) runs 72 yards to Newburyport 1. One big improvising play in the second half stood out. 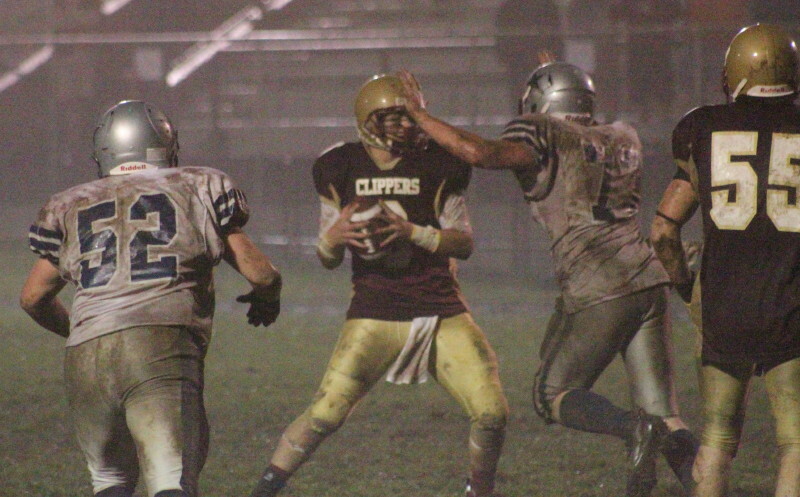 Brandon saw the Clipper defense shift to his left and so he carried right, cut back into the middle, then down the left sideline for 72 yards to the Newburyport one yard line. Other teammates tried to rush in from there unsuccessfully before Brendon finished the job himself to put NA ahead, 26-7 in the third period. The Knights (3-1) had plenty of weapons beside Brandon. He threw eighteen times and great protection kept him from being hurried on any of them. He completed twelve throws including touchdowns in each half. Clipper QB Connor Wile saw plenty of pressure but still connected on 14 of 18 attempts including a 34-yard TD pass to Brett Fontaine with 2:57 left until halftime. Connor rolled right on that play to buy time and lofted a pass, over the top of turned-around defender Tom Moody, that Brett had to leap to get. Brett Fontaine hit hard by Dan Laorenza (7), Nate Hitchcock (56), Glen Hartford (44) and Tom Moody (30). 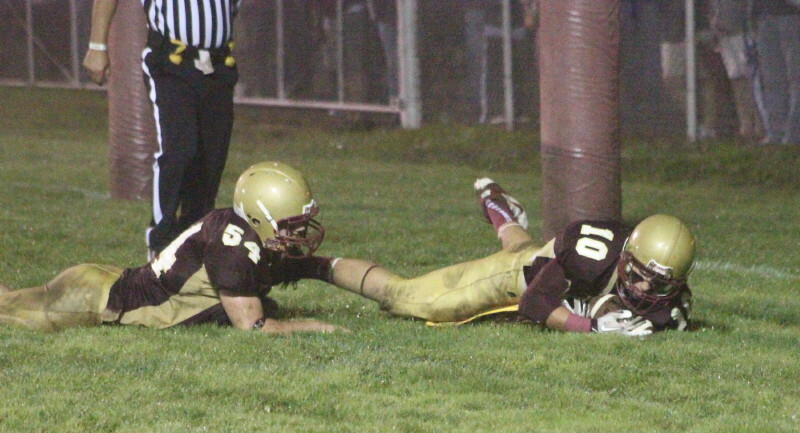 Speaking of Brett, he was rocked after a couple of receptions. One picture shows him being hit by four NA players and his helmet pushed back. He came out of that play holding his left arm and I suspect that sight had the NHS basketball and baseball coaches holding their collective breaths. Newburyport won the toss and deferred. They tried an onside kick that didn’t work and gave NA great early field position. 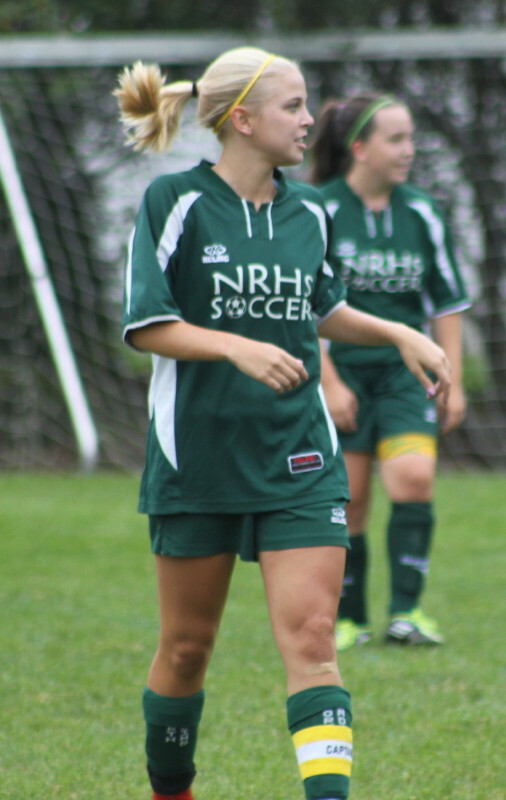 NHS head coach Ed Gaudiano took a severe chiding from the referee after complaining loud and early about, what he saw to be, NA holding. 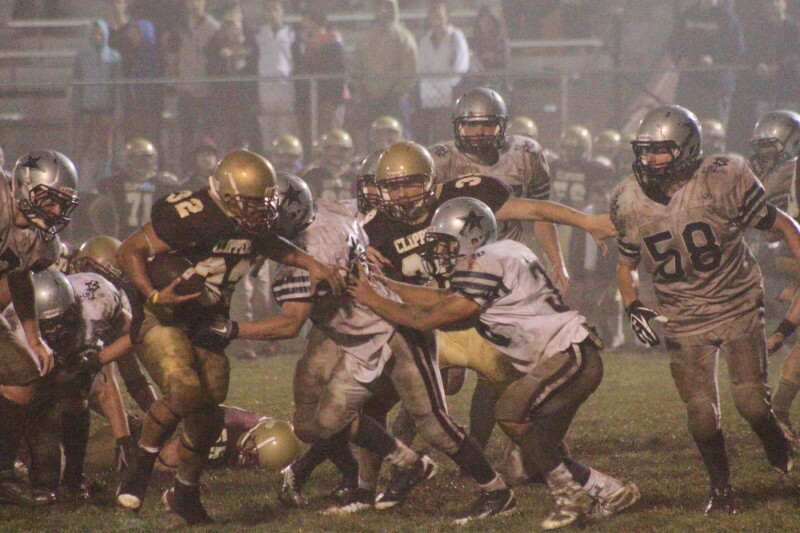 Newburyport started the second half with the ball (their own 27) trailing just, 13-7. They could gain just four yards in three plays. 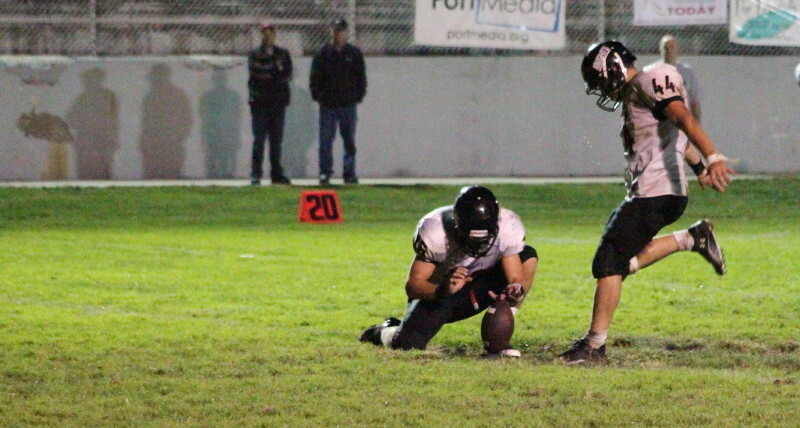 The punt attempt turned disastrous as a low snap forced punter Trevor Pituck to kneel to get it and the play was ruled dead at the N17. 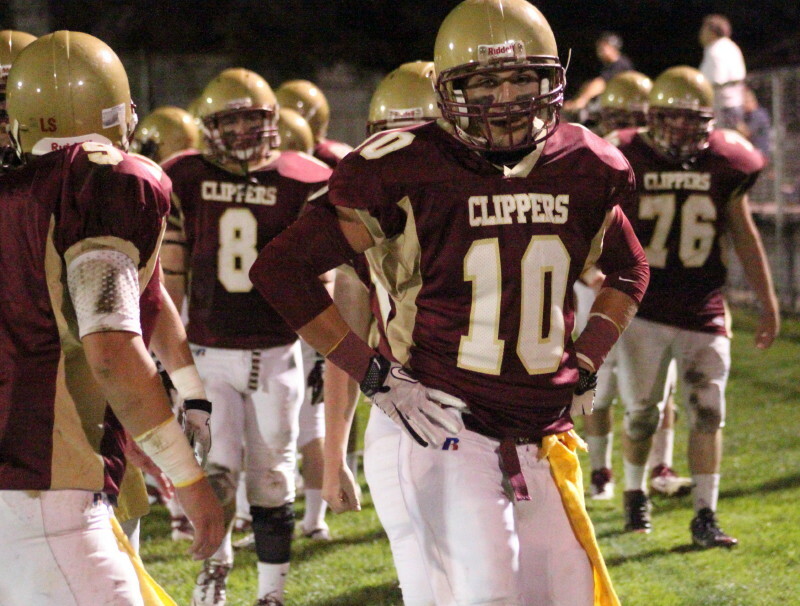 Clipper QB Connor Wile stands in the pocket with good protection. NA was quick to capitalize. 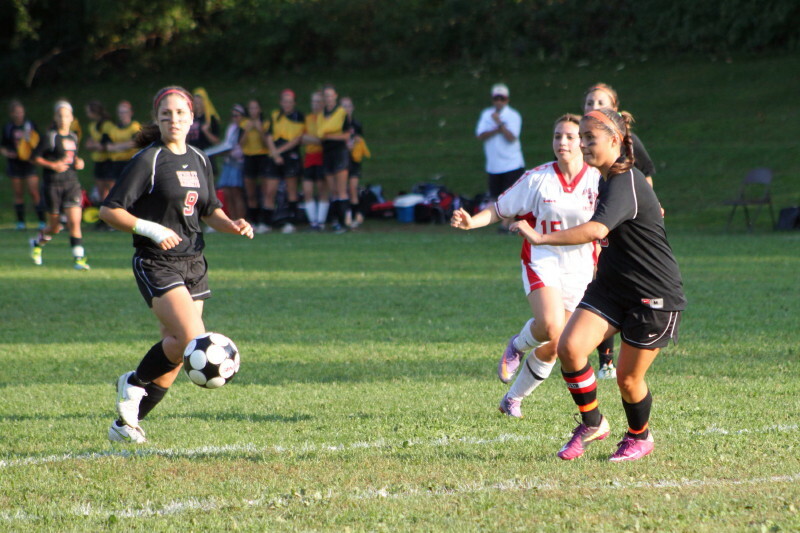 After a six-yard run by John Iannone, Brandon started to scramble and then at the last second threw left to Dan Laorenza who finished off the final eleven yards to score. There was a delay as officials discussed whether Brandon was over the line of scrimmage when he threw to Dan. It was ruled he wasn’t. Glen Hartford’s extra point kick put the Knights in front, 20-7 with 8:10 left in the third quarter. 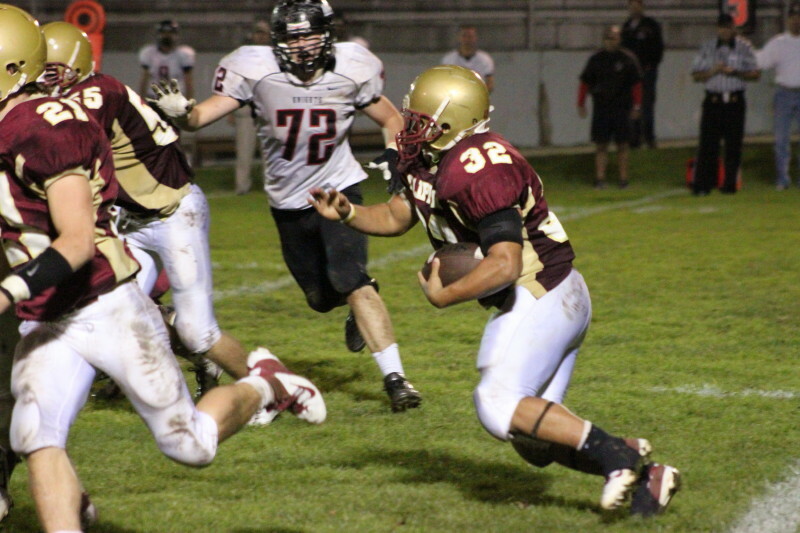 NA’s first touchdown was on a John Iannone seven-yard sweep around the right end. The final Knight score was at the end of a long drive that started on the NA 23. Glen Hartford got the TD. He lined up in the backfield and went out into the flat after a fake handoff and was wide open on the right side for an easy connection with Brandon. 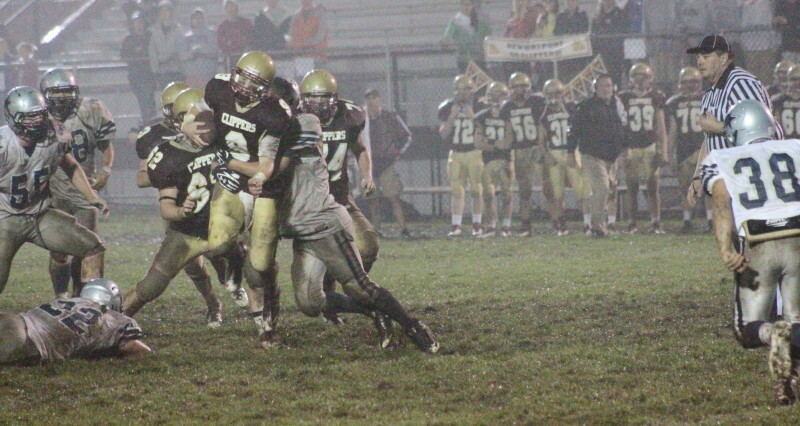 Jared Bradbury (11) stuffs John Iannone (23) near the Clipper end zone. 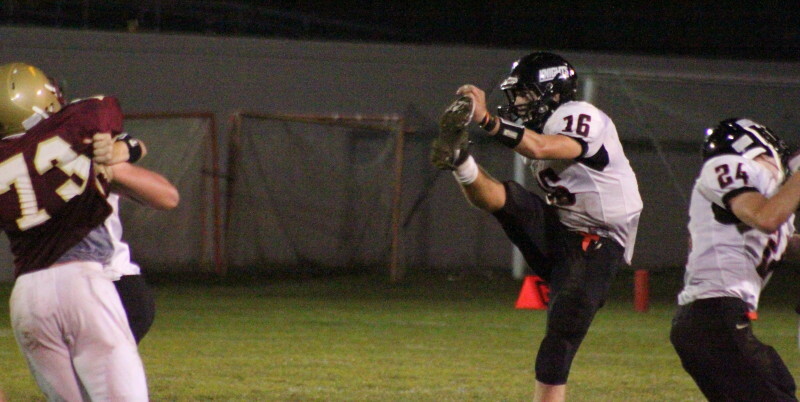 Brandon was also the punter and holder. I don’t recall seeing him much on defense. One NA partisan told me that Brandon is getting recruited by D1 schools as a safety. I read a recent article on Brandon that suggested that his best sport may be baseball where he is a catcher. 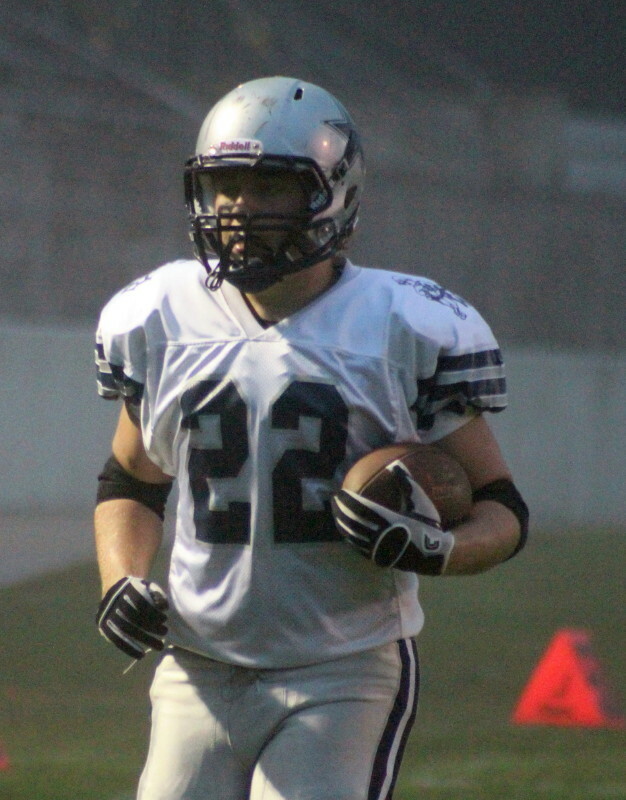 Jared Bradbury had the defensive hit of the night on a Knight receiver. 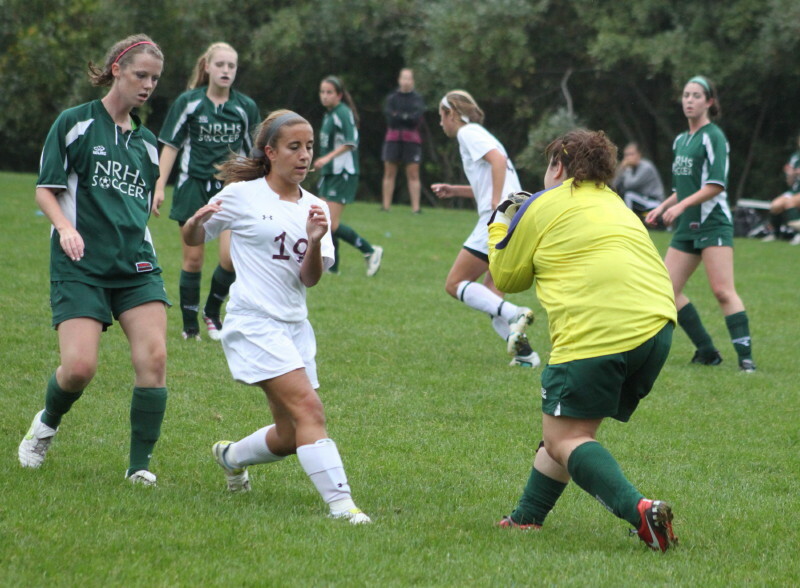 Newburyport (2-2) plays next Thursday night (7PM) at Marblehead. 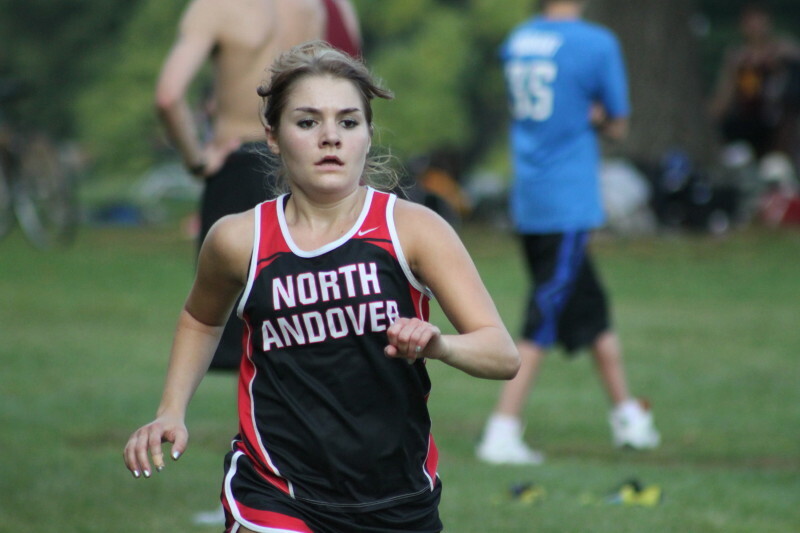 North Andover (3-1) is at Medford next Friday night. The pictures will enlarge to normal size if you click on them. 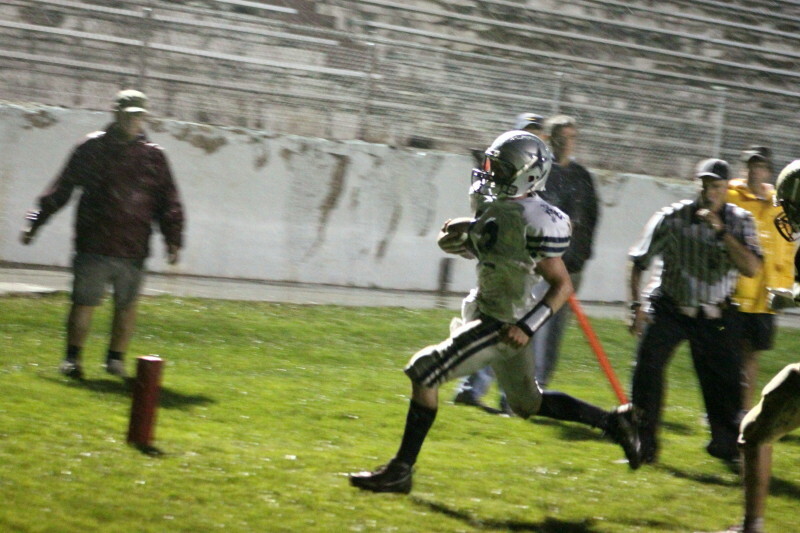 Brett Fontaine (10) after touchdown catch. Glen Hartford kicked four extra points. 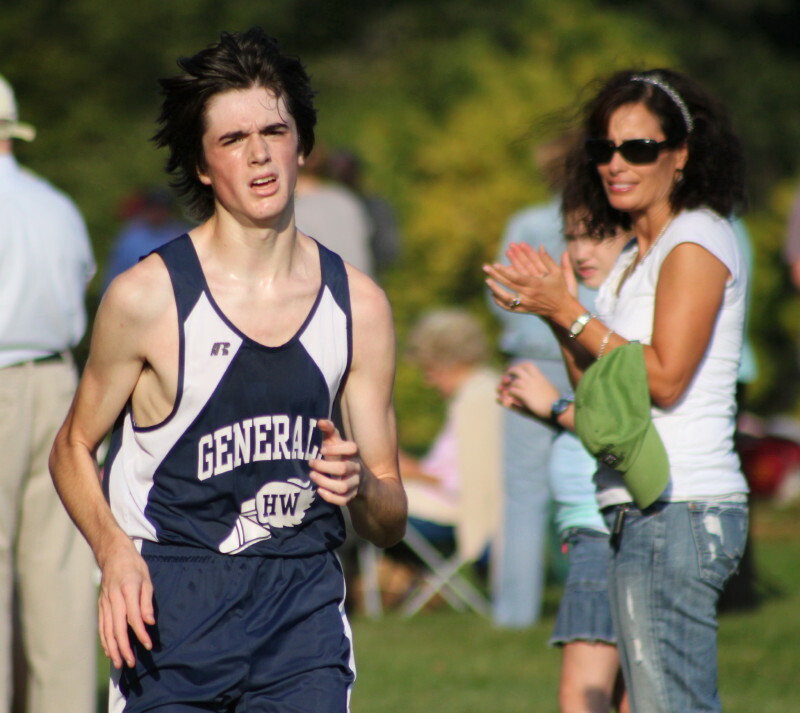 Brandon Walsh holds. 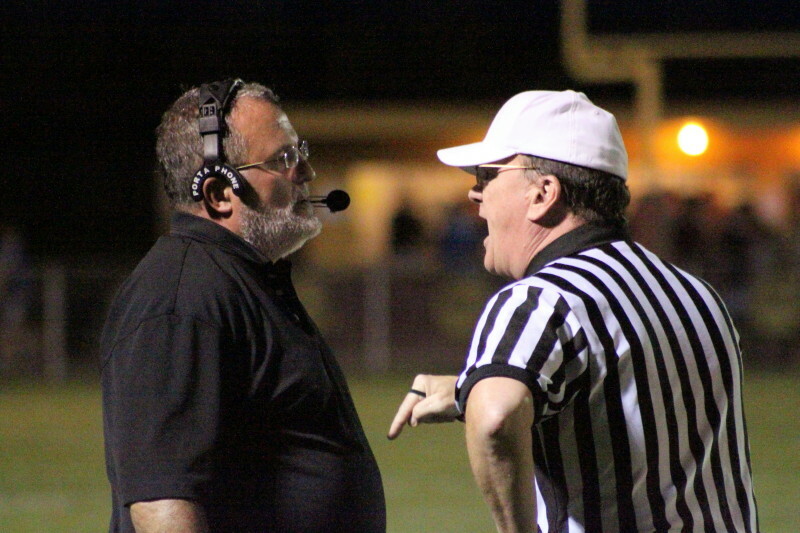 NHS coach Bob Clarke hears from the referee. 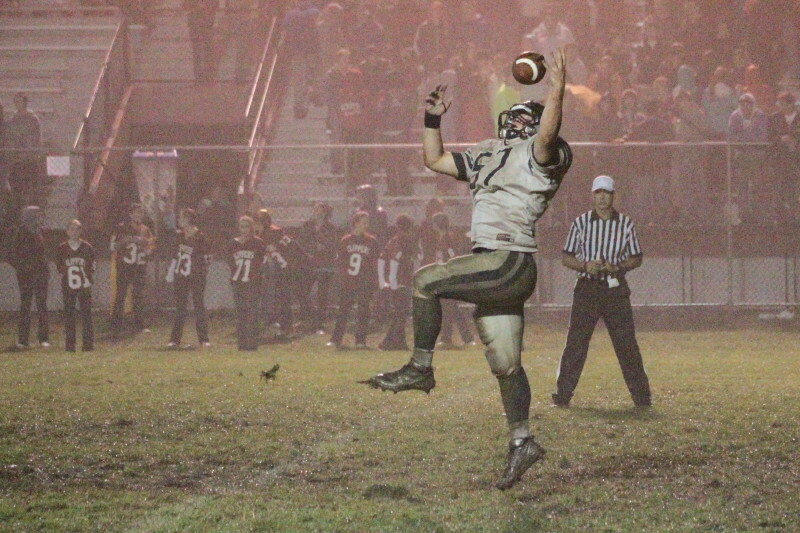 HW punter Shane Jenkins leaps to catch a high snap in the 4th quarter. 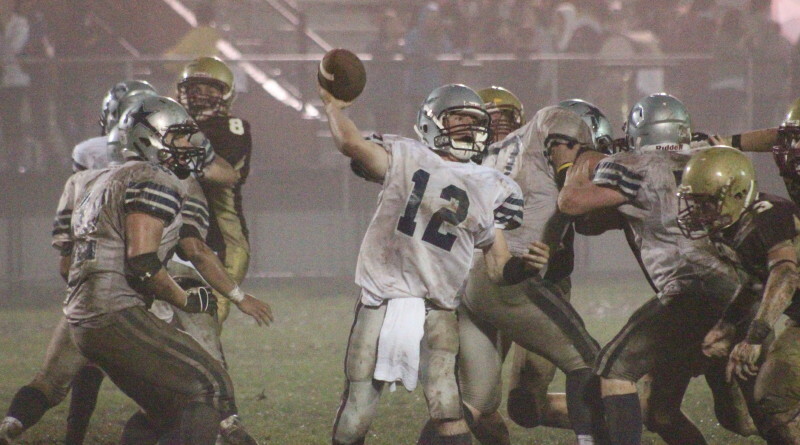 NHS quarterback Connor Wile scrambles on 4th-and-8 in the fourth quarter. 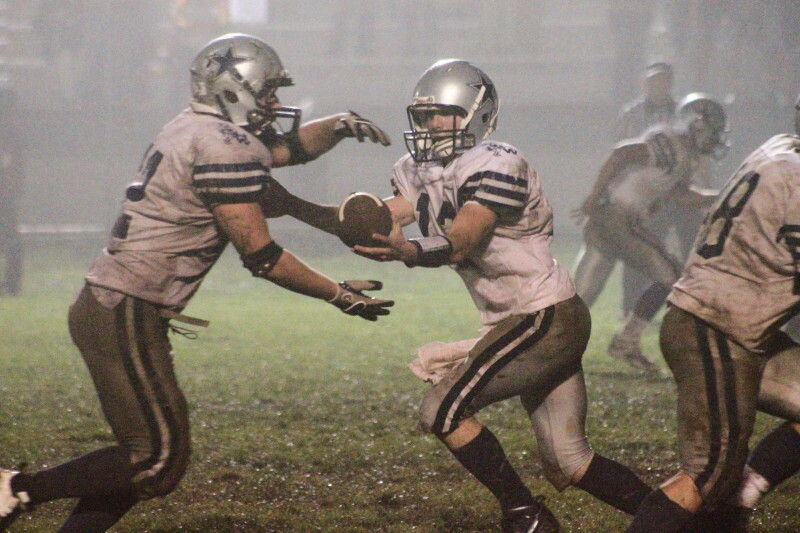 (Newburyport) The Hamilton-Wenham Generals (3-0) continued undefeated with an 18-6 win over the Newburyport Clippers (2-1) on Friday under the lights and a persistent mist. 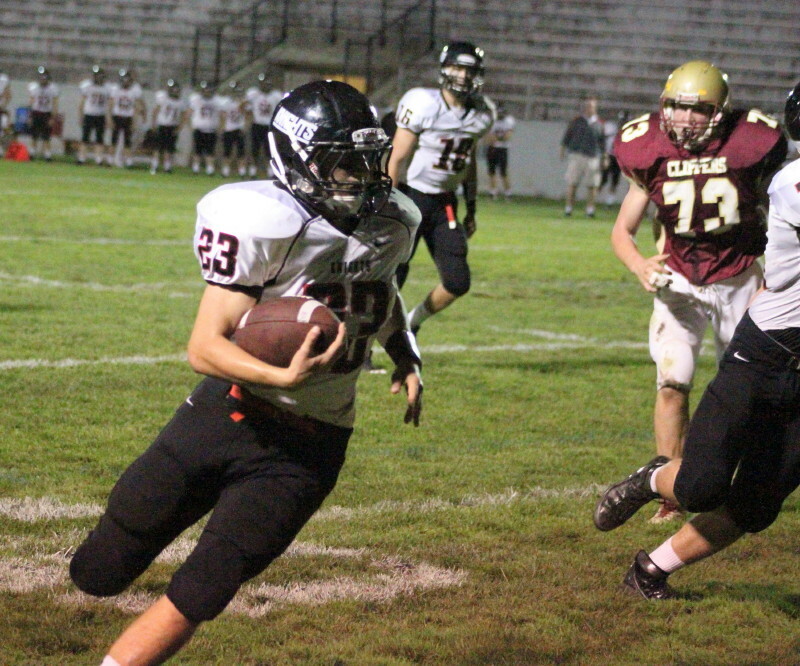 The final score is misleading because Newburyport showed right from the start that they could make yards against Hamilton-Wenham. 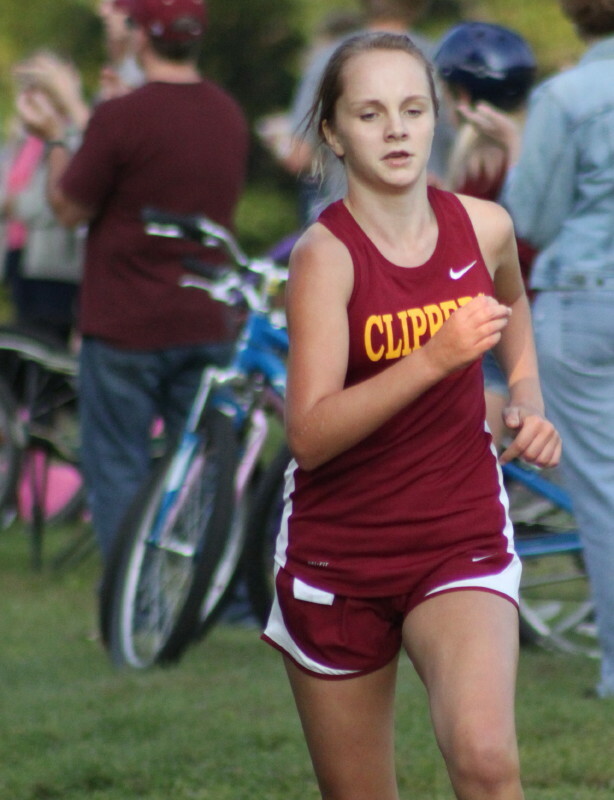 In fact, the Clippers scored on their first series (Jimmy Conway 12 yard pass from Connor Wile). 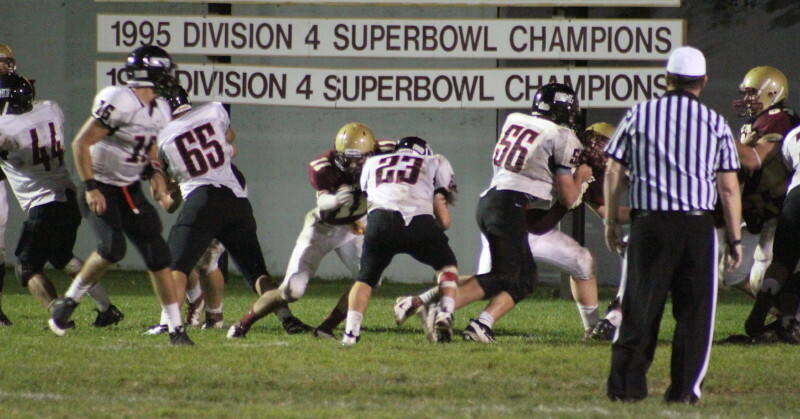 After that, despite good field position most of the time, the end zone eluded the home team. Contributing to the lack of scoring were; mishandled snaps, penalties, and failure to convert 4th down opportunities. On the other hand, HW was much more consistent on offense and much more diverse. They scored one touchdown (Trevor Lyons) on the outside, another on the inside (Elliott Burr), and a third in the air (Pete Duval). The two biggest plays, in my opinion, happened in the fourth quarter. In the first one, the Generals (ahead 12-6) were forced to punt from their side of the field with five minutes left in the game. 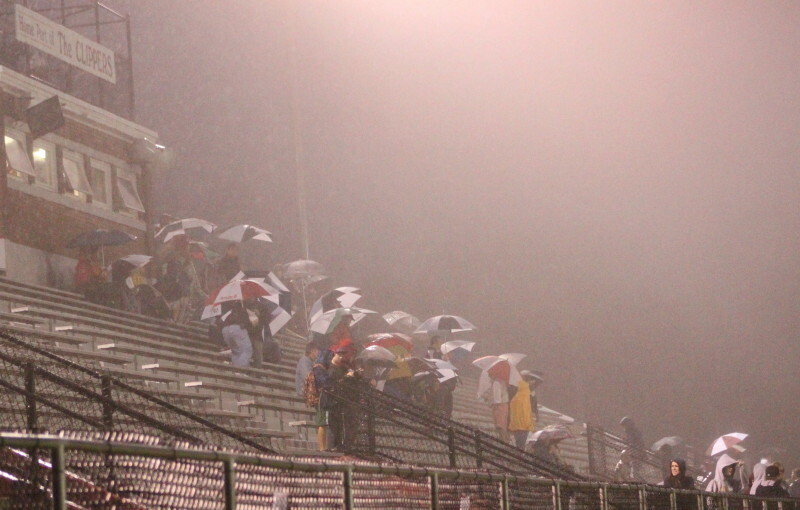 Certainly the wet condition were a factor as the snap was high to HW punter Shane Jenkins. The 6’2” senior leaped to make a one-handed snag and came down to get off a good punt. If that snap had gone over his head, or been fumbled, the Clippers would have been set up very deep in HW territory with a chance to move in for at least a tie. The second big play was a defensive stop by HW. Clinging to a 12-6 lead with 3 ½ minutes left, HW defended the Clippers into a 4th-and-8. On the next play, QB Connor Wile wanted to pass but ended up scrambling up the middle because of HW pressure. A measurement showed that he ended up inches from a drive-continuing first down. The Generals followed that 4th down stop with a march that ended in the Clipper end zone as QB Trevor Lyons completed a 23-yard pass to Pete Duval with 1:49 left to seal the win (18-6) for HW. 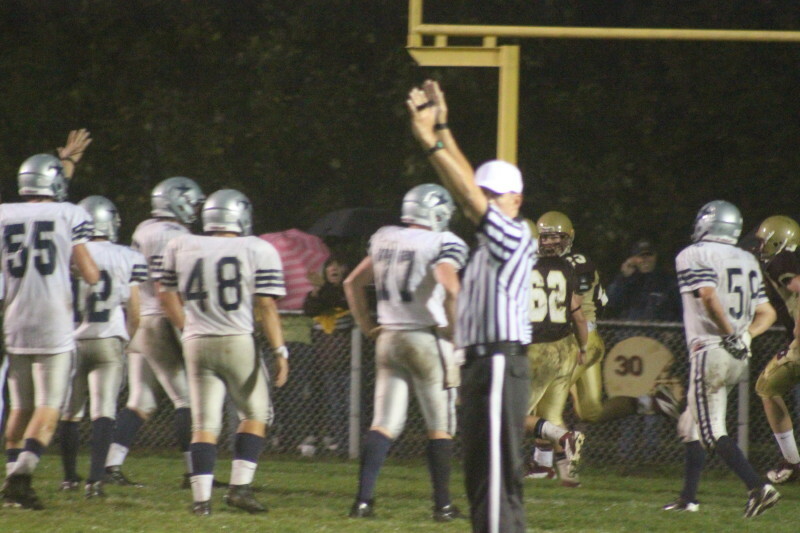 Referee signals Jimmy Conway (#23) TD in first quarter. The Clippers’ lone TD covered 12 yards as Jimmy Conway made a leaping catch near the middle of the end zone at 3:59 of the first quarter. 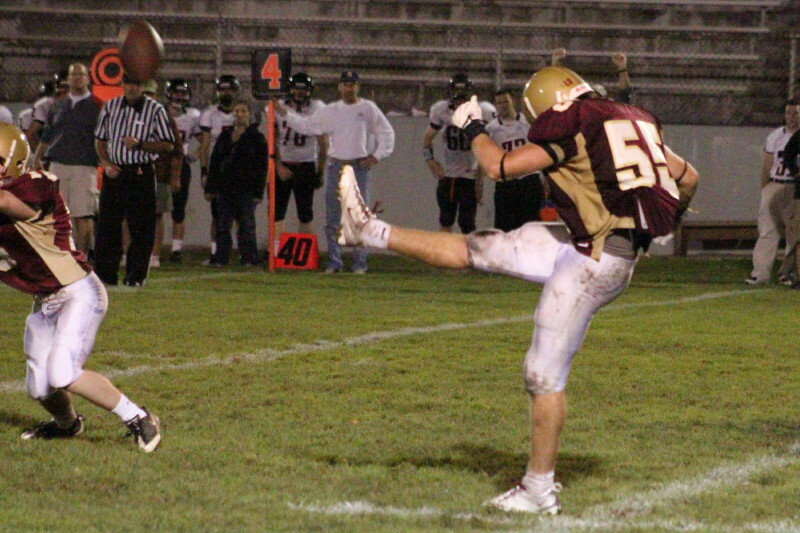 Brandon Trego’s extra point attempt was blocked. Elliott Burr (112 yards – 1 TD) converted a 4th-and-2 to keep an early second quarter HW drive going. Quarterback Trevor Lyons finished the drive with a clean 5-yard sweep right after faking a handoff to Elliott Burr. 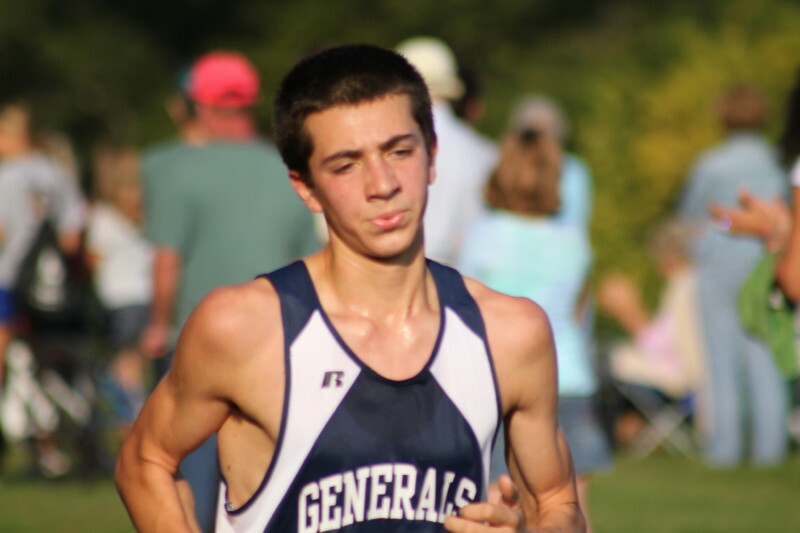 Matt Putur’s rush for extra points failed. Tied 6-6, the Generals struck again in the second quarter. Consecutive carries on the inside by Elliott Burr ended when he crossed the goal line on a 2-yard carry with 4:19 left. Another failed rush followed for extra points but HW still led, 12-6. 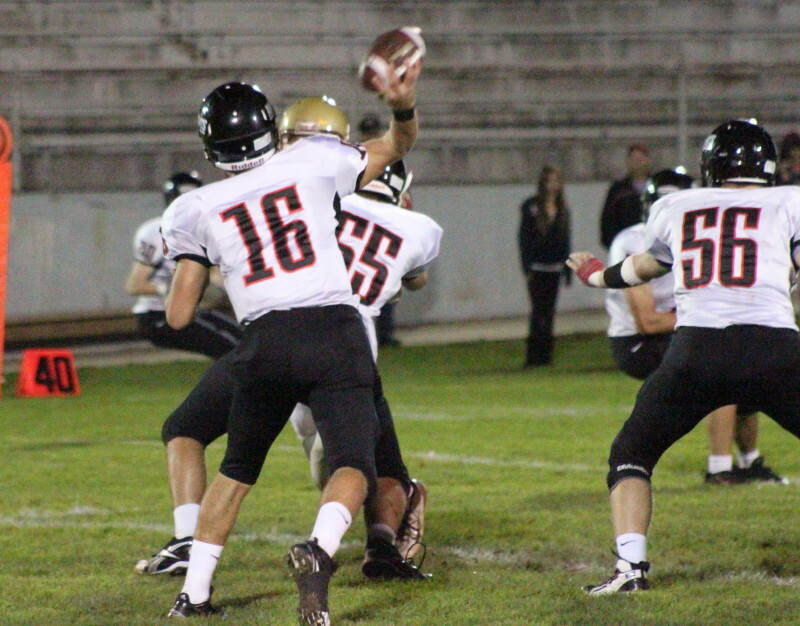 HW quarterback Trevor Lyons sweeps right untouched for 5-yard TD in second quarter. The visitors would build on that lead late in the 4th quarter. The Pete Duval catch produced the points but it was a long sweep down the left sidelines by QB Lyons that set HW up at the Newburyport 25. 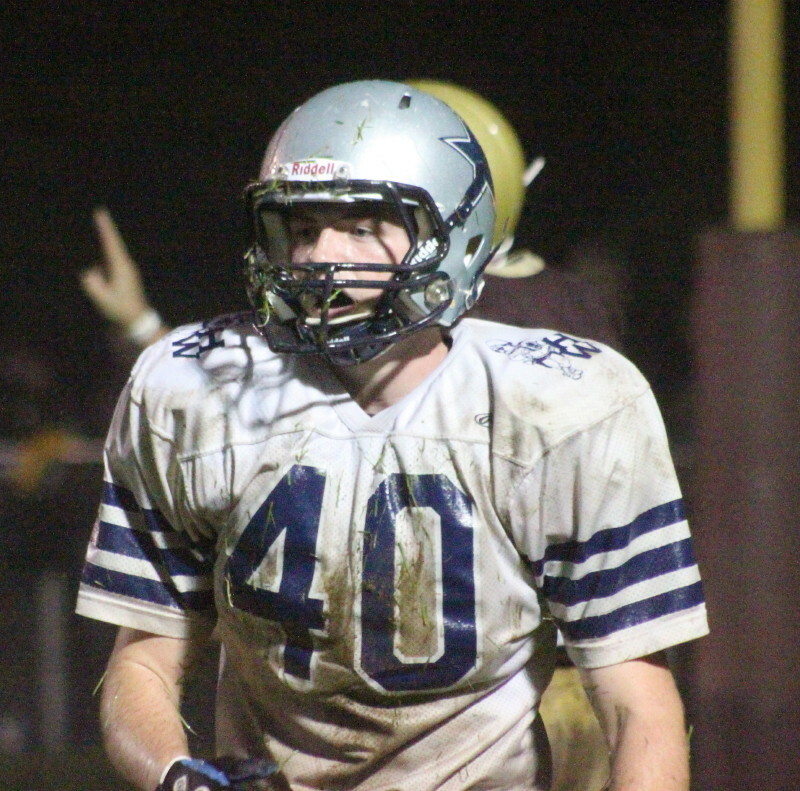 Brett Fontaine recovered a fumble in the end zone in the third quarter. 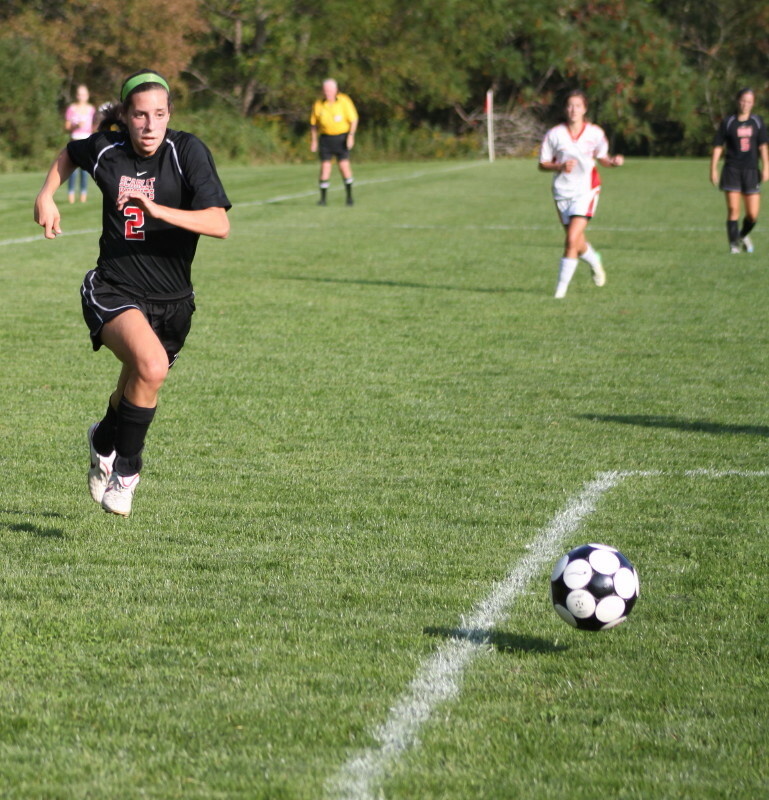 HW hosts Amesbury (2-1) on October 1st (Saturday) at 2:30PM. 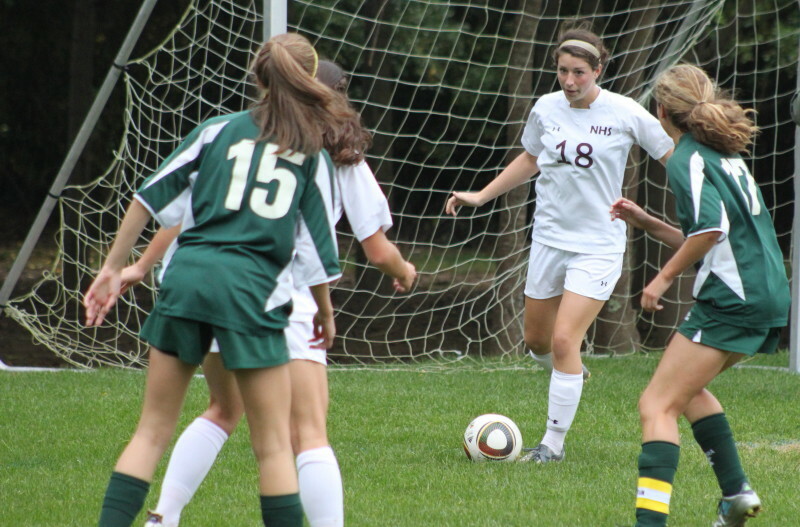 Newburyport entertains North Andover (2-1) on September 30th (Friday) at 7PM. Clicking on any of the pictures enlarges them to normal size. QB Trevor Lyons throws from the pocket in 3rd. 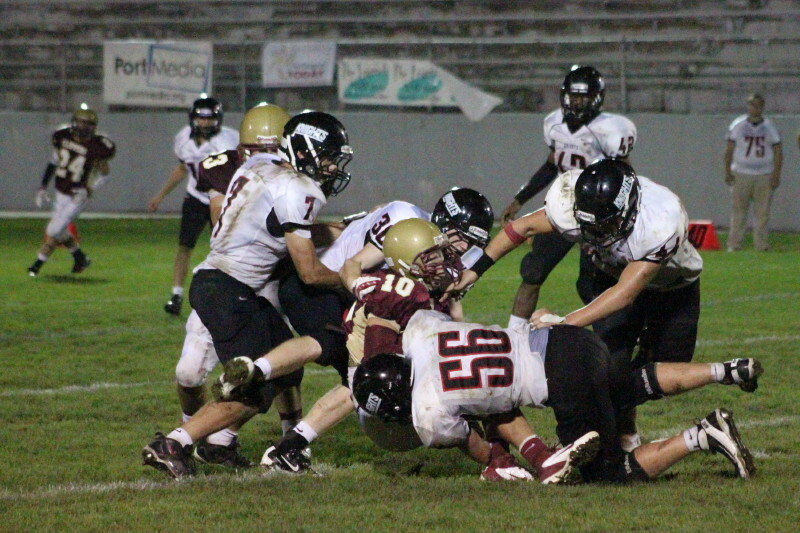 Brett Fontaine (#10) recovers fumble in 3rd. 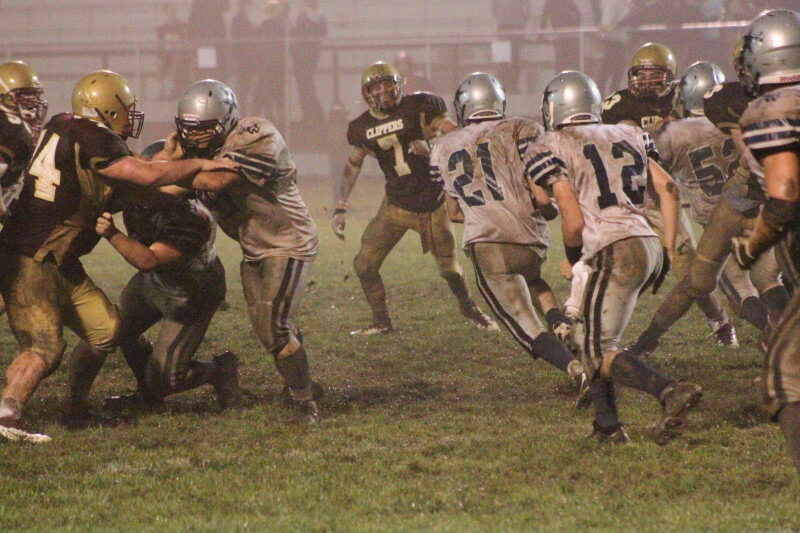 Matt Putur (#21) finds hole. 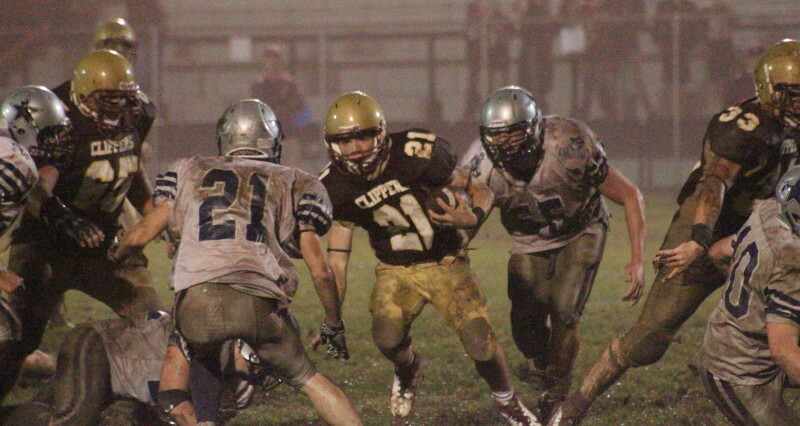 Clipper Tyler Cusack (#21) has Matt Putur (#21) on one side and Taylor Drinkwater (#55) on the other. 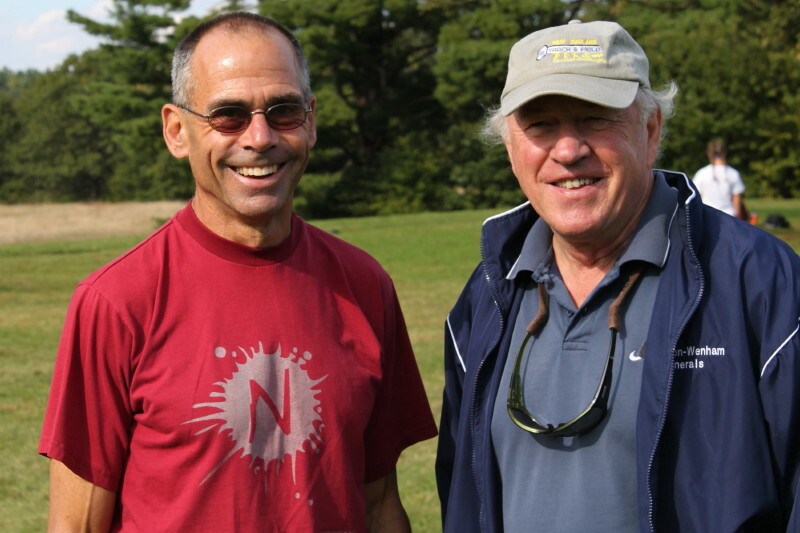 Two of the best cross country coaches around (Don Hennigar & Steve Sawyer) matched up at Maudslay State Park and both came away with a reason to smile. 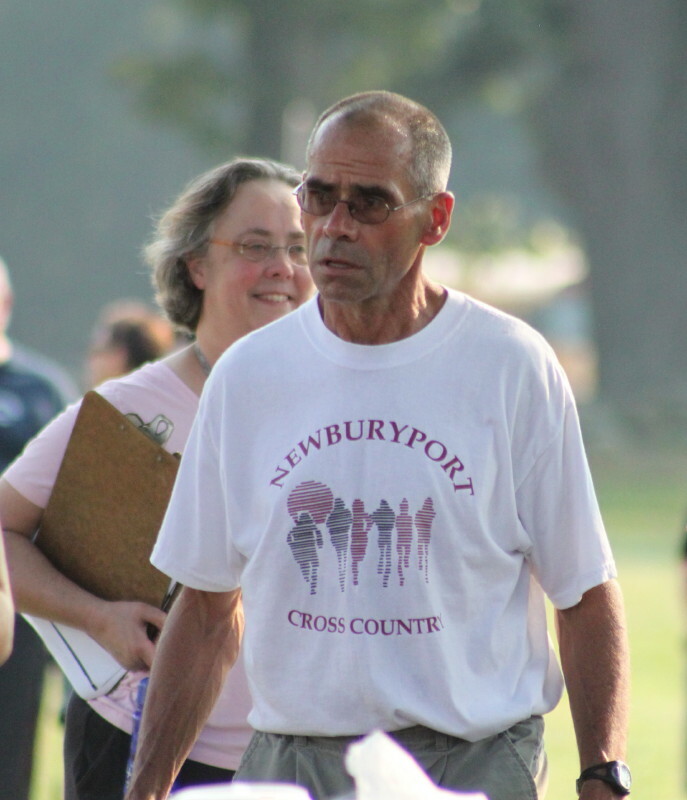 (Newburyport) Two of the best, and I’m not just writing about the coaches, won easily at Maudslay State Park on a pleasant Wednesday afternoon in Cape Ann League cross country competition. 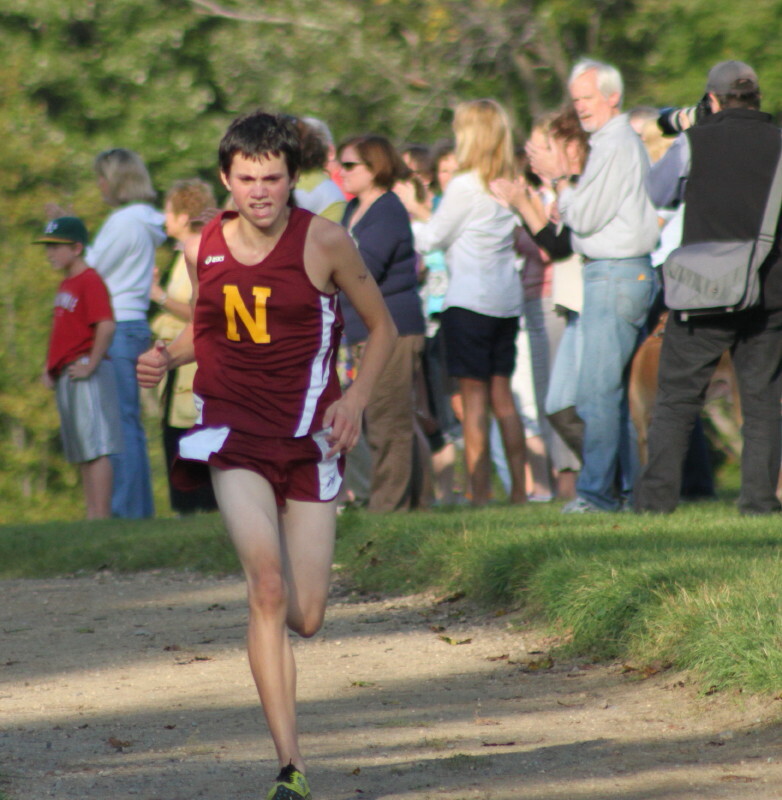 Chris Suprin (16:02) surged down the stretch to nip teammate Keith Conway for the win. 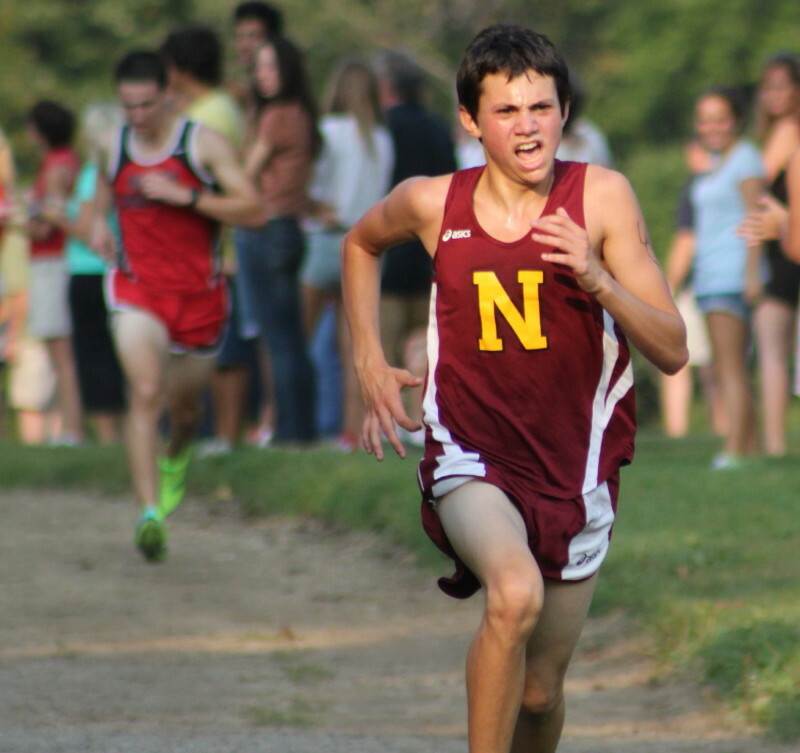 Don Hennigar’s undefeated Newburyport boys team (4-0) stayed that way capturing the first five spots. 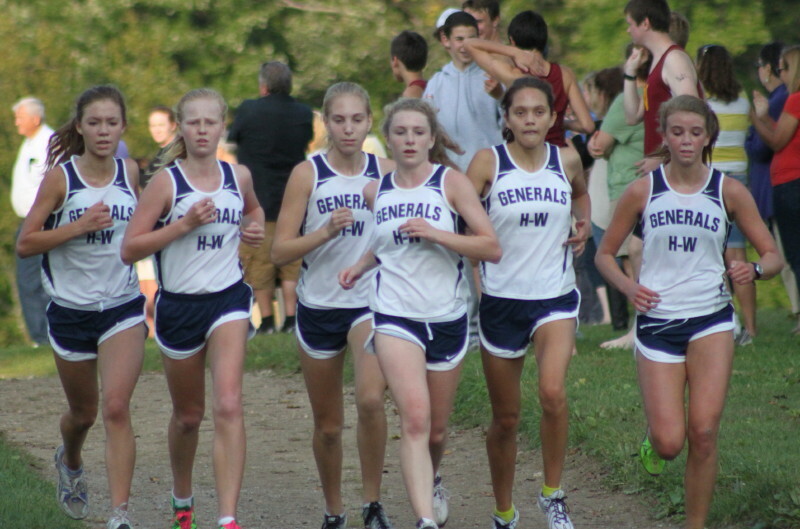 Steve Sawyer’s undefeated Hamilton-Wenham girls team (4-0) crossed the finish line in a six-member, first place blanket. 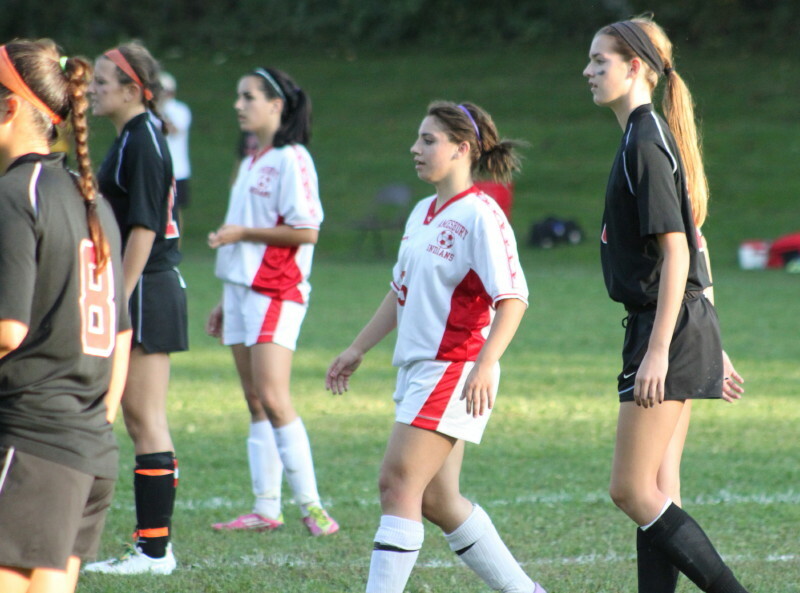 Thanks to HW athletic secretary Dianne Bucco for identifying the girls in the picture for me. HW stuck the Clipper boys with their only regular season loss in 2010. 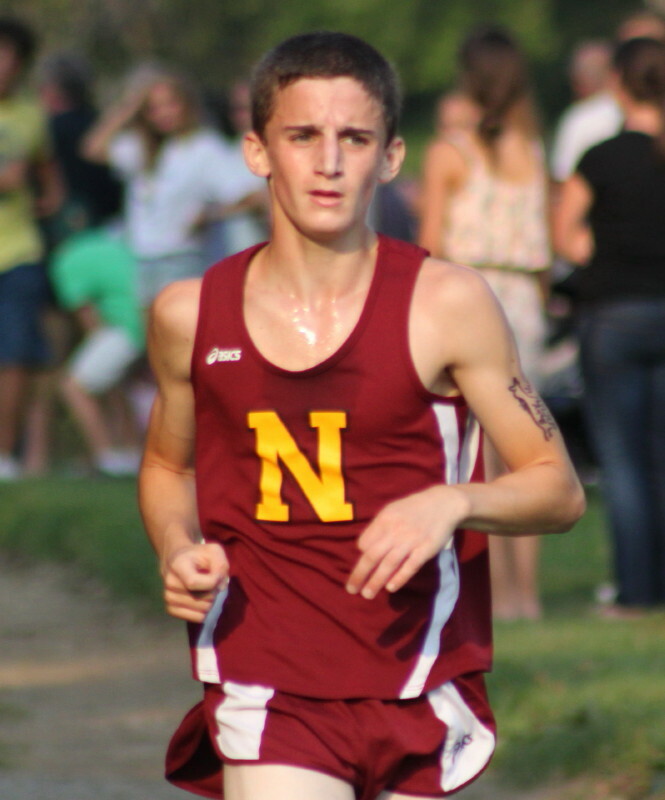 Chris Suprin’s late race surge was enough to edge teammate Keith Conway for first place by a second – 16:01. 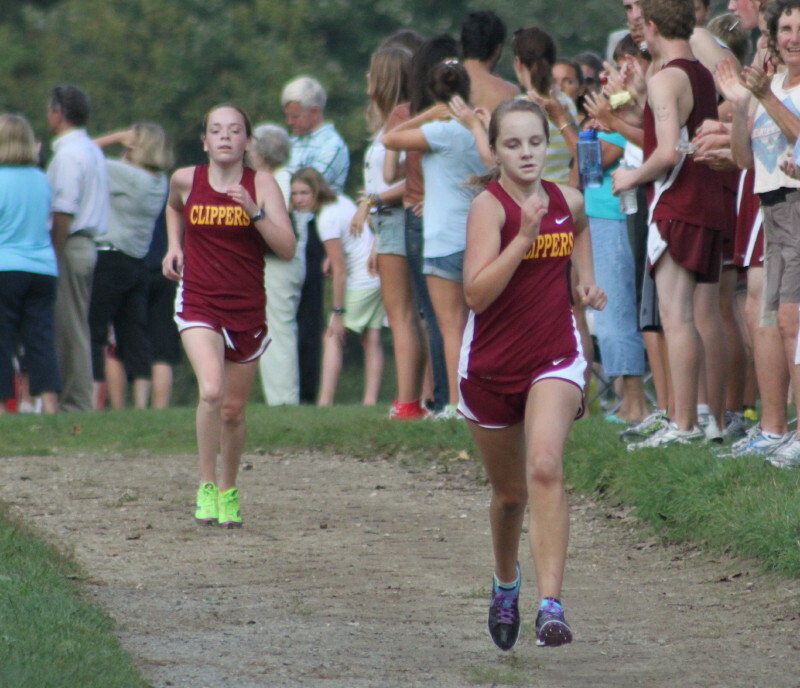 (Left-to-Right) Clair Pacione, Emily Weigand, Meg Blatchford, Emily Horgan, Kerry Phelan, and Sarah Duffy finish together. The HW girls finished in what looked like a normal workout mode with no effort made to lunge ahead late. The official gave the six HW girls the finishing cards and told them to sort out the order of finish among themselves. (I collect my own information and take my own pictures. I make a serious attempt to be accurate. Mistakes can happen.) Clicking on a picture will increase its viewing size. 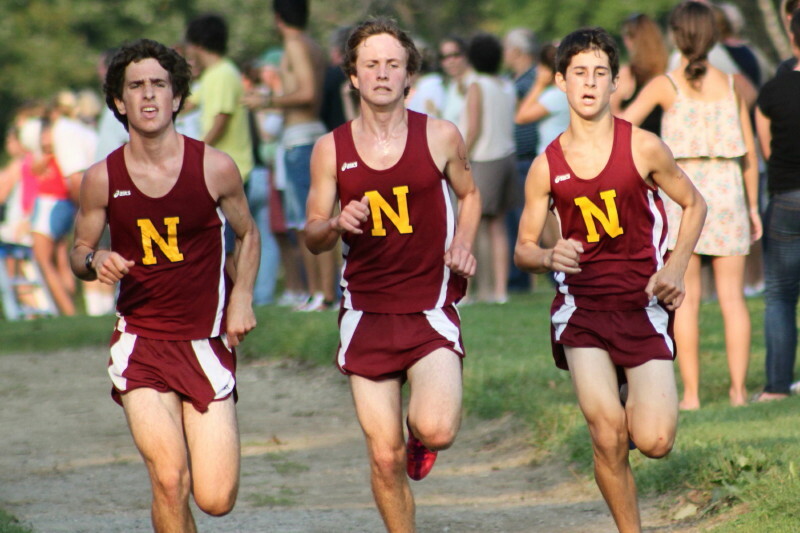 Adam Traxler (#5) chased by Sam Benford (#10) and Peter Eliopoulos (#7). 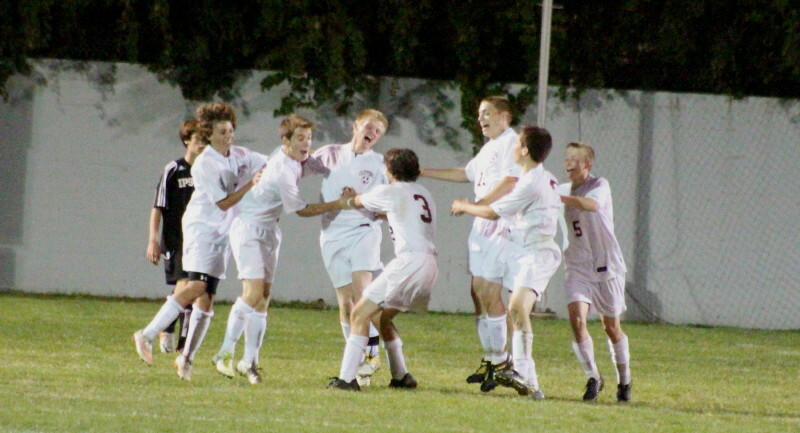 Clippers celebrate Spencer Traxler’s go-ahead goal. 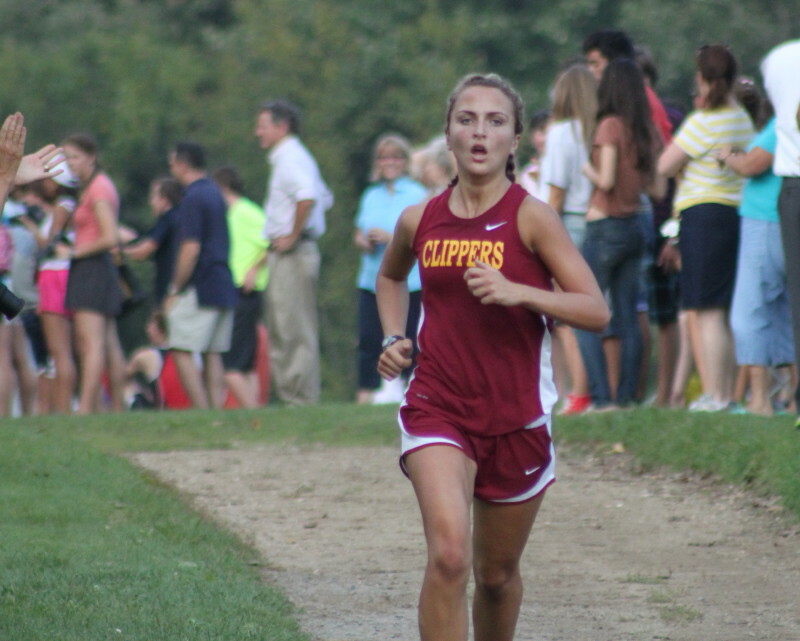 (Newburyport) Too much of the Traxlers for Ipswich. 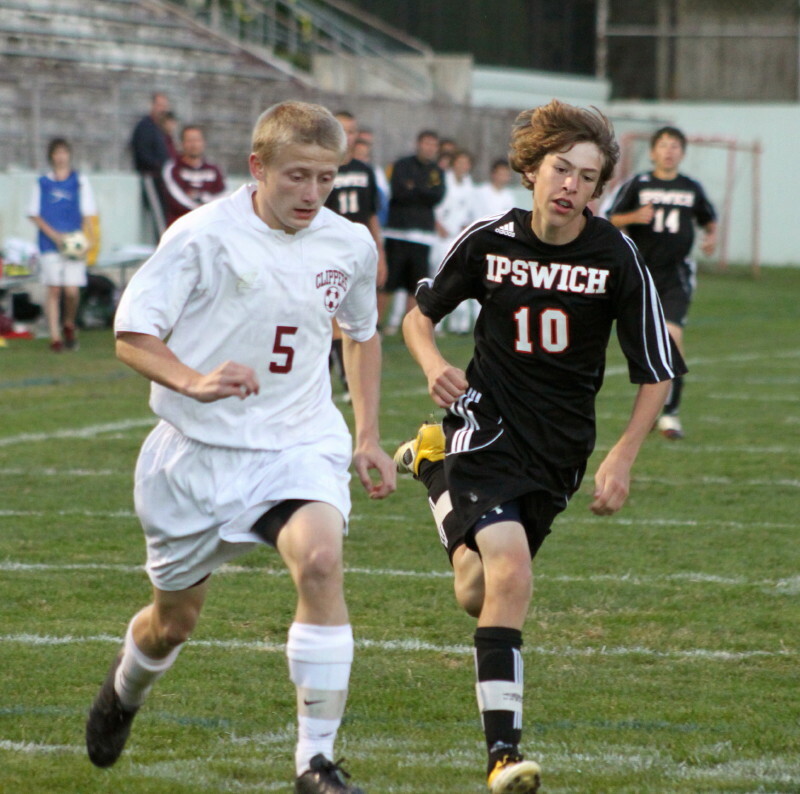 The Tigers (2-3) were defeated by Newburyport, 4-2, in boys soccer on Monday night at Newburyport Stadium in Cape Ann League play in the Clippers‘ home opener. 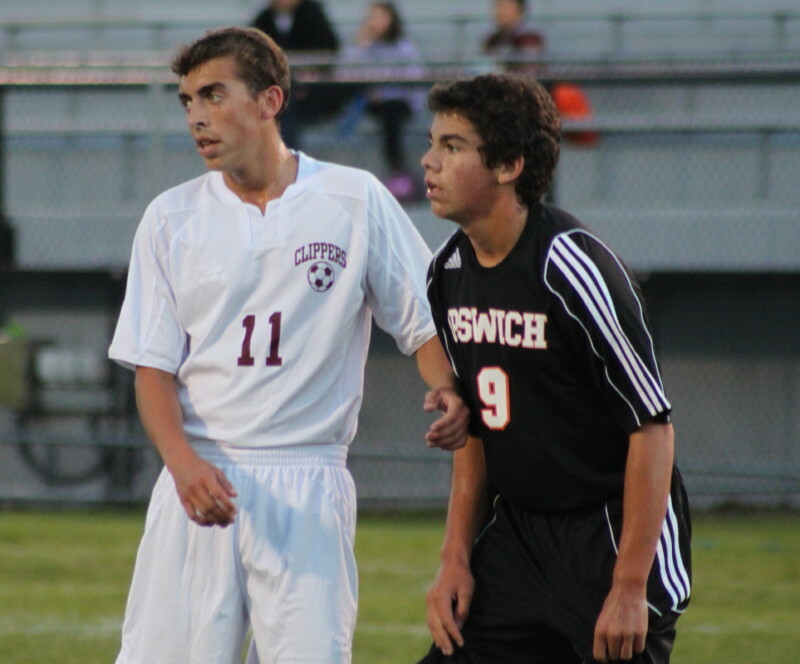 The Traxlers (sophomore Adam & senior Spencer) scored all of the Clipper (1-1-2) goals, including three in the second half. 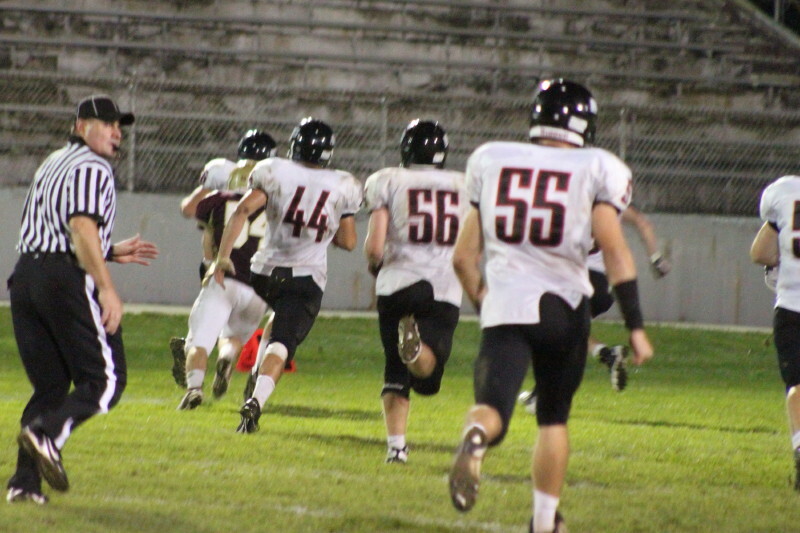 Adam Traxler (#5) was indeed a threat in this one every time he was near the ball. He endangered the Tiger defense numerous times dribbling into open space and let shots fly on net with either foot. He finally got a shot past Ipswich goalie Erik Fyrer with a spin to the left at 10:48 to give NBPT a 1-0 lead. 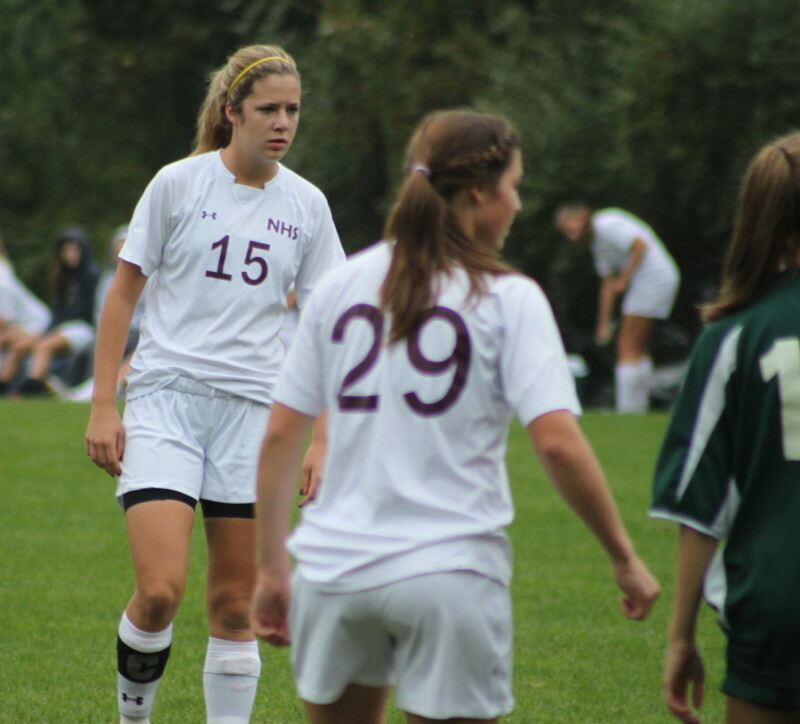 The Tigers didn’t have a shot on net for the first twenty-six minutes but responded to Adam’s first goal with one of their own just 1 ½ minutes later. 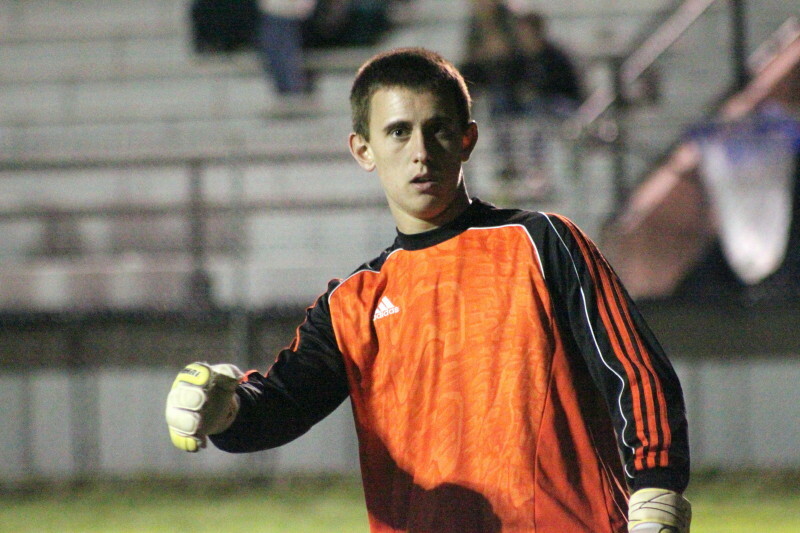 2010 CAL All-Star Ryan Law dribbled into the middle and then beat NHS goalie Matt Canning to tie the score. 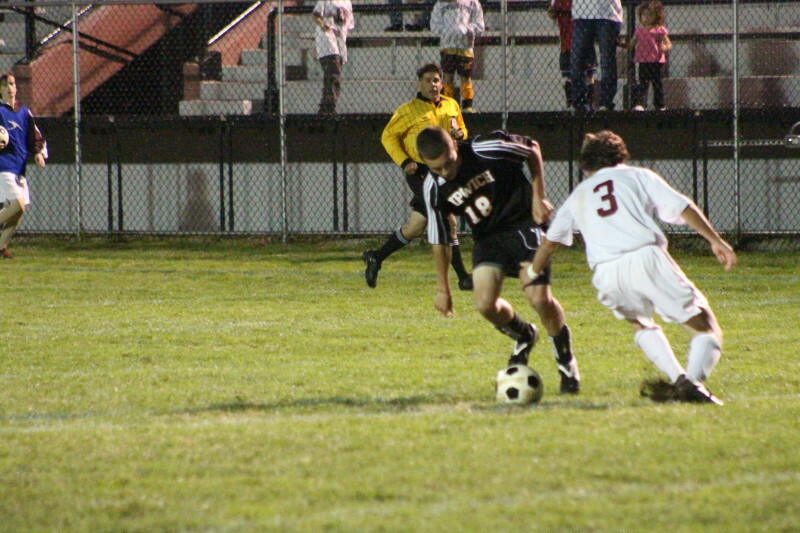 Cole Lewis (#3) about to pull down Matt Jaeger for penalty kick. 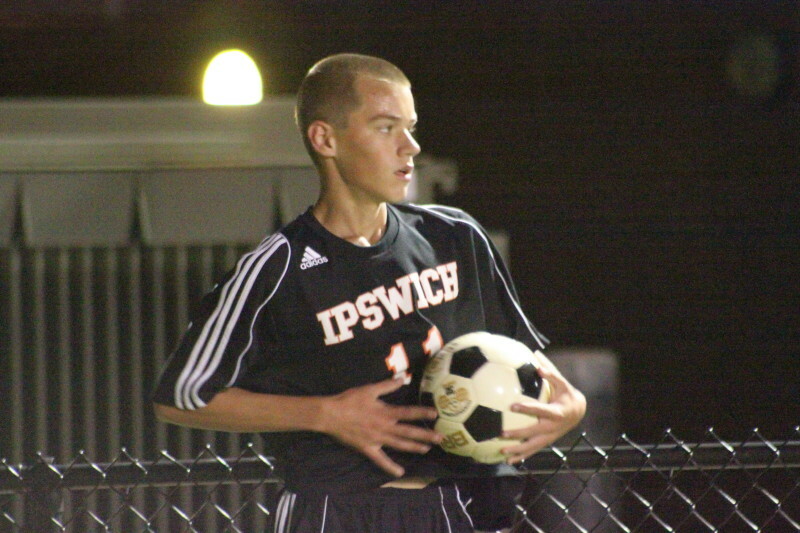 Ipswich pulled ahead, 2-1, early in the second half as a Matt Jaeger break in forced defender Cole Lewis to pull him down in the box. Senior Joe Baraiolo grounded the resulting penalty kick past Matt Canning’s left at 36:40. Adam’s 2nd goal tied the score (2-2) sixteen minutes later. 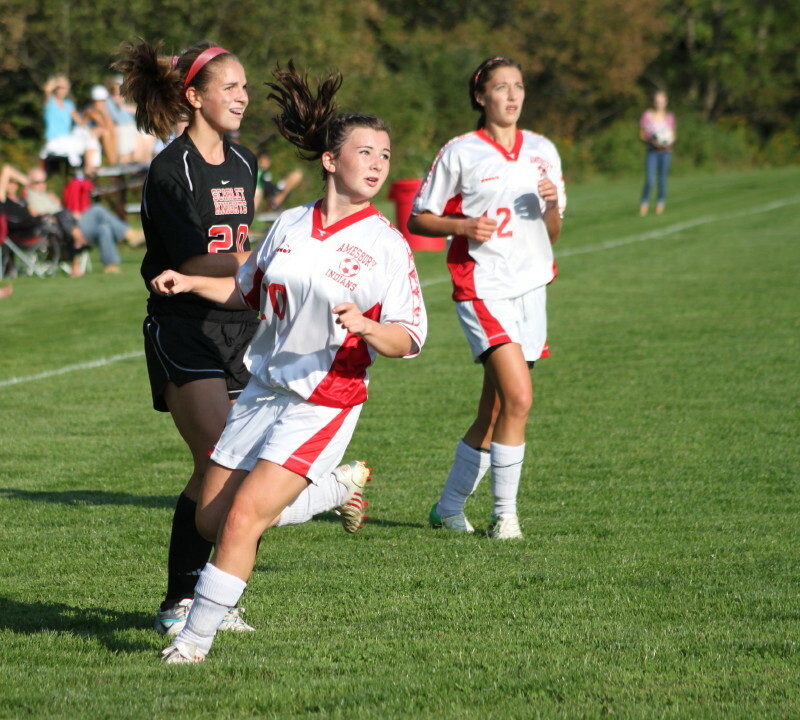 Both teams seemed to sense the importance of the next goal and both had glittering chances. 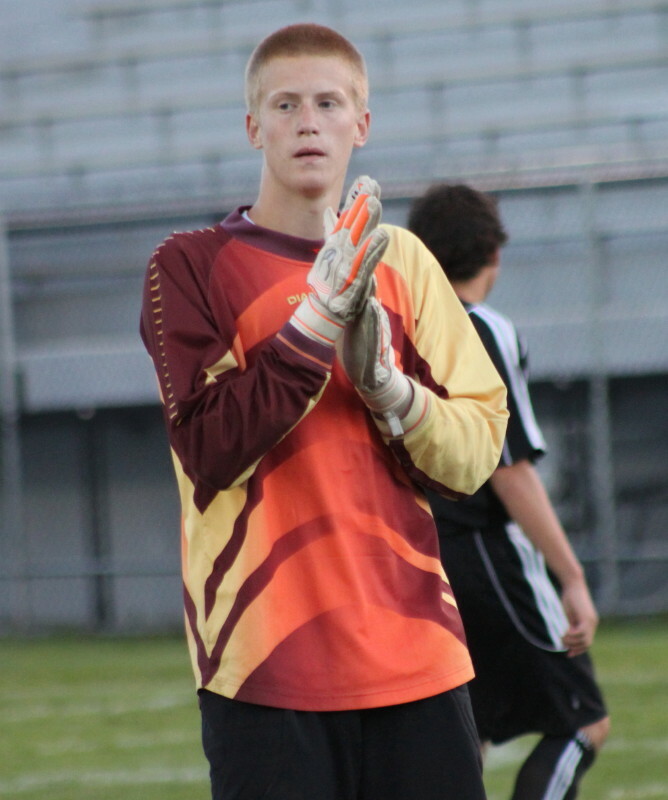 Finally Spencer Traxler put his left foot on a ball that crossed in front and NHS led, 3-2, with seven minutes to go. That goal seemed to do in Ipswich. Adam pounced on a bad Ipswich clearout and quickly made it, 4-2, just a minute later to give the Clippers Win #1. 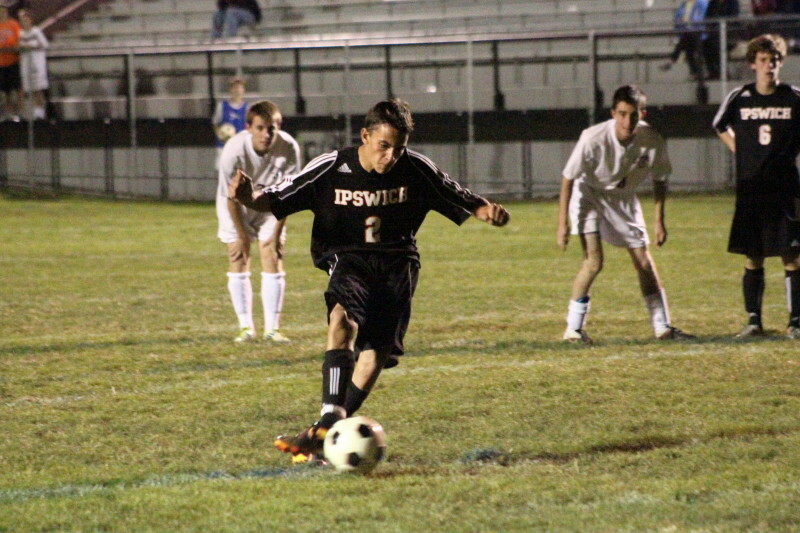 Joe Baraiolo strikes successful penalty kick for Ipswich. Nice to see the scoreboard used to keep track of the time and the score. That’s the beauty of playing in a stadium. 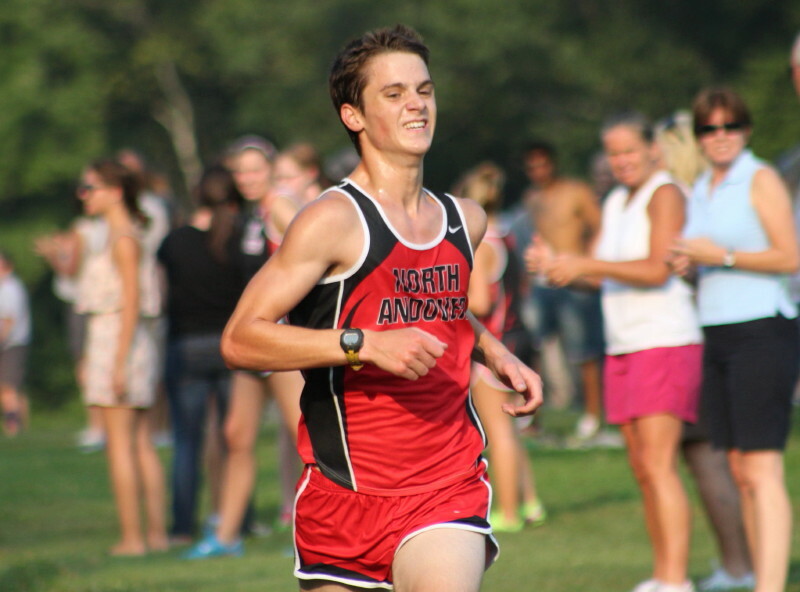 Alex Sullivan leads North Andover. 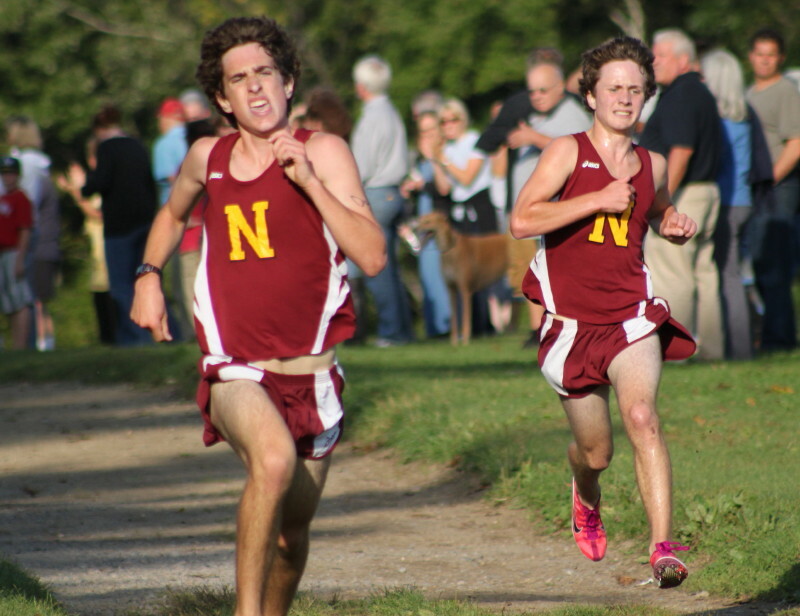 (Newburyport) The undefeated Newburyport (3-0) boys came at North Andover (2-1) in a bunch on Maudslay State Park’s 3-mile course and defeated the visitors, 22-35, in cross country on Wednesday afternoon in Cape Ann League competition. (left to right) Chris Suprin, Keith Conway, and Joe Santo sweep 2-4 together. 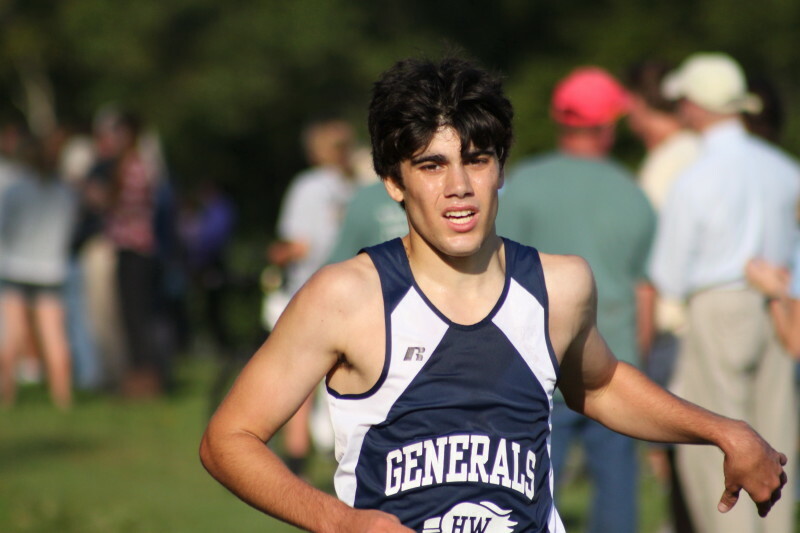 NA‘s Alex Sullivan (16:00) easily won the event but had to wait over a minute before 6th place teammate (Greg Macarthur – 17:07) arrived. 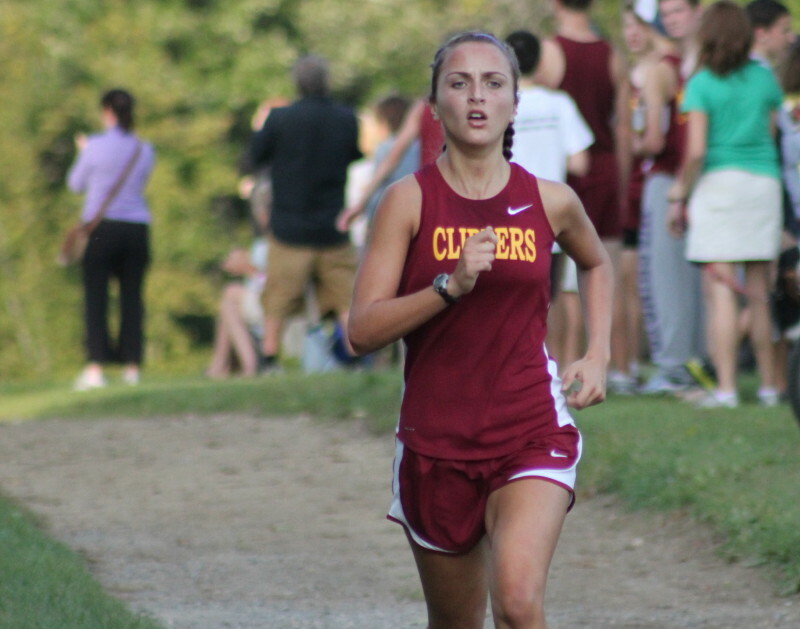 Meanwhile, Clipper runners Chris Suprin, Keith Conway, Joe Santo, and Nick Carleo took places 2-5. 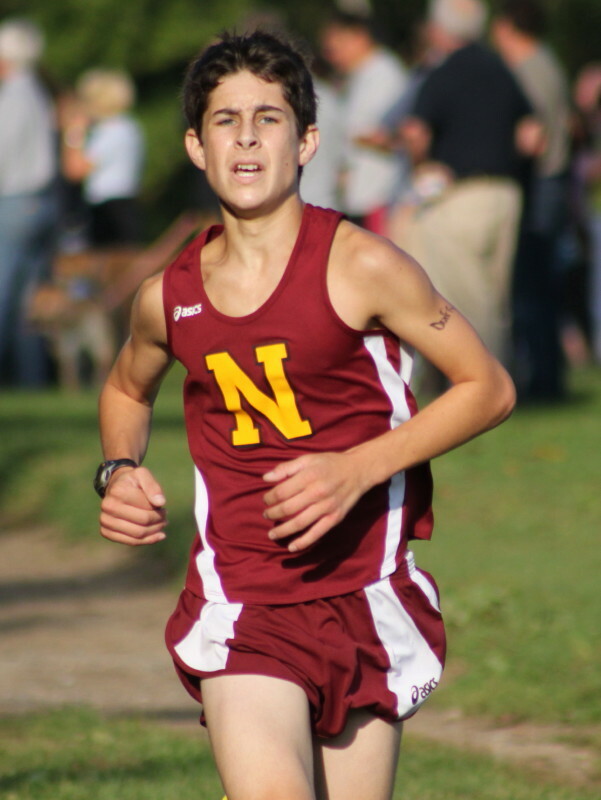 Sophomore Chris Orlando completed the Newburyport scoring with an 8th place finish. 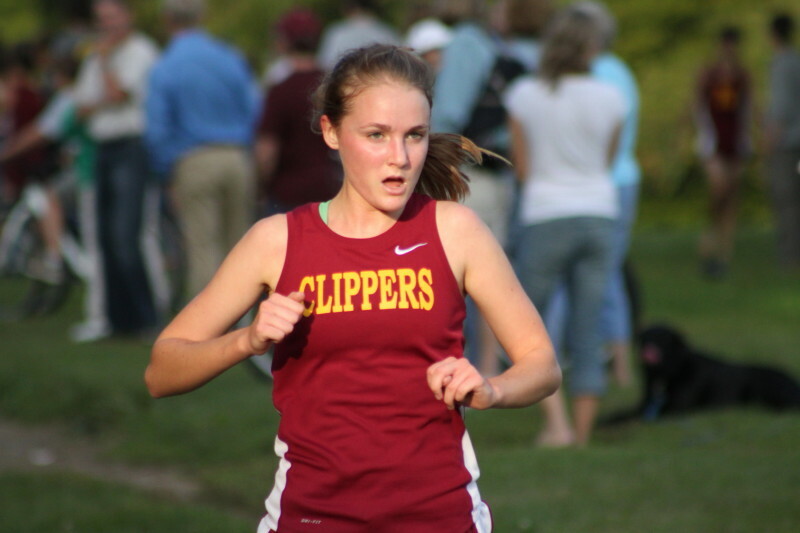 The Newburyport Clipper girls (2-1) took out NA (2-1), 23-34, sweeping the first three spots. 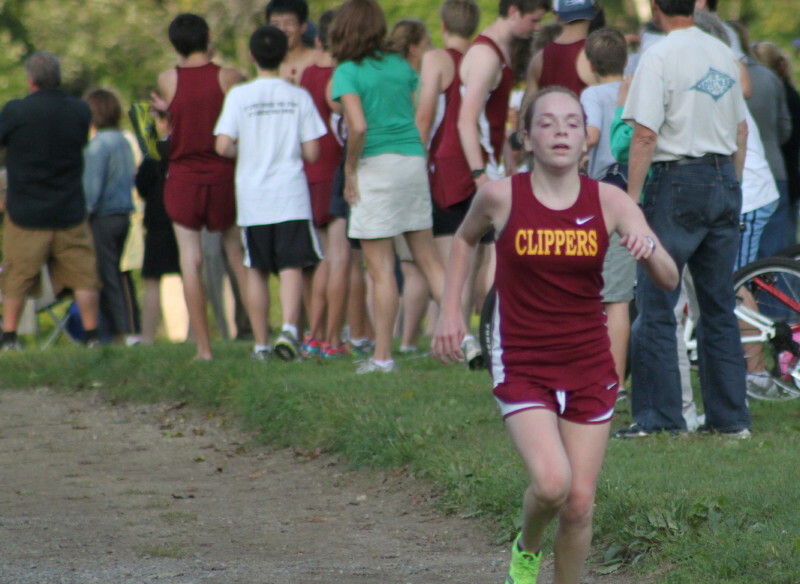 Clipper senior Kiley Knowlton (20:40) finished alone. 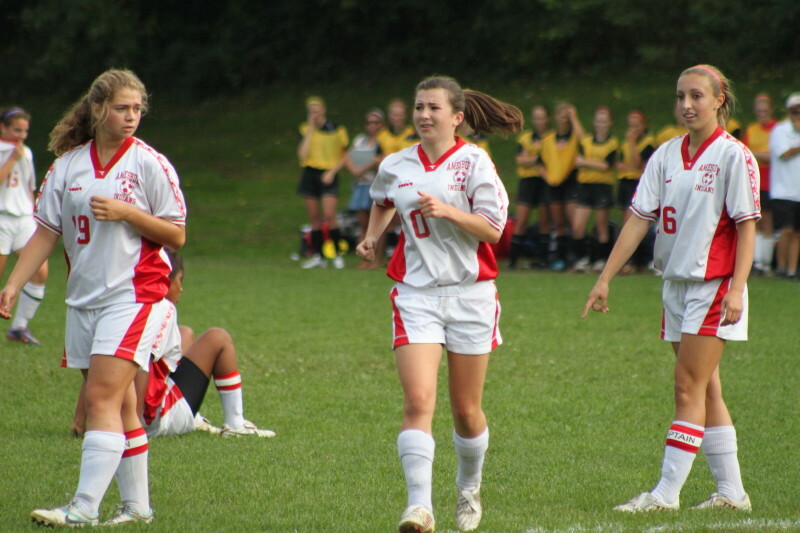 Forty seconds later teammates Kelly Conway and Erin Carroll were in. 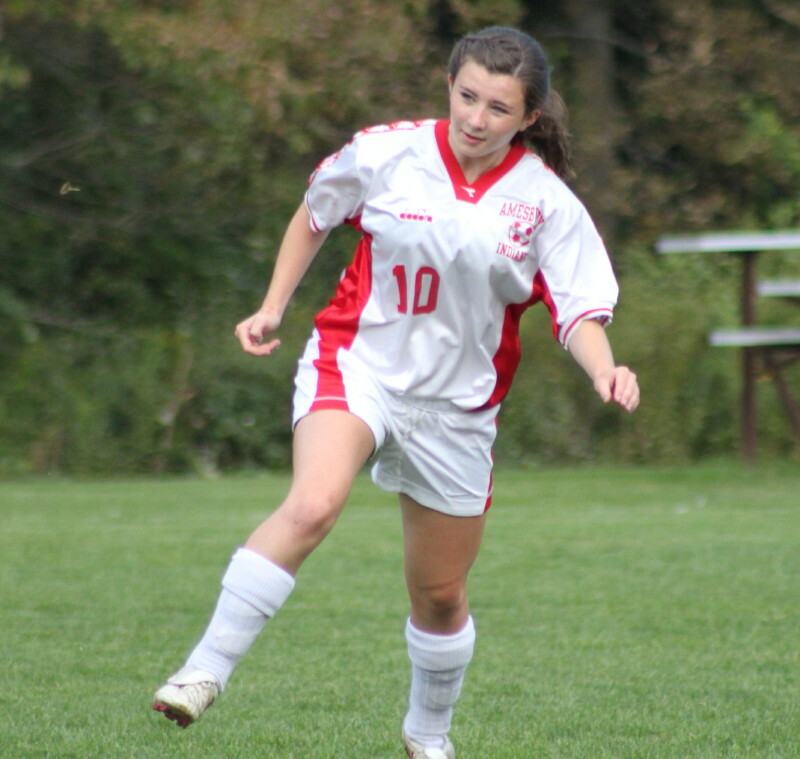 Getting those first three spots was crucial because the Knights covered 4-7, led by Danielle Poto. 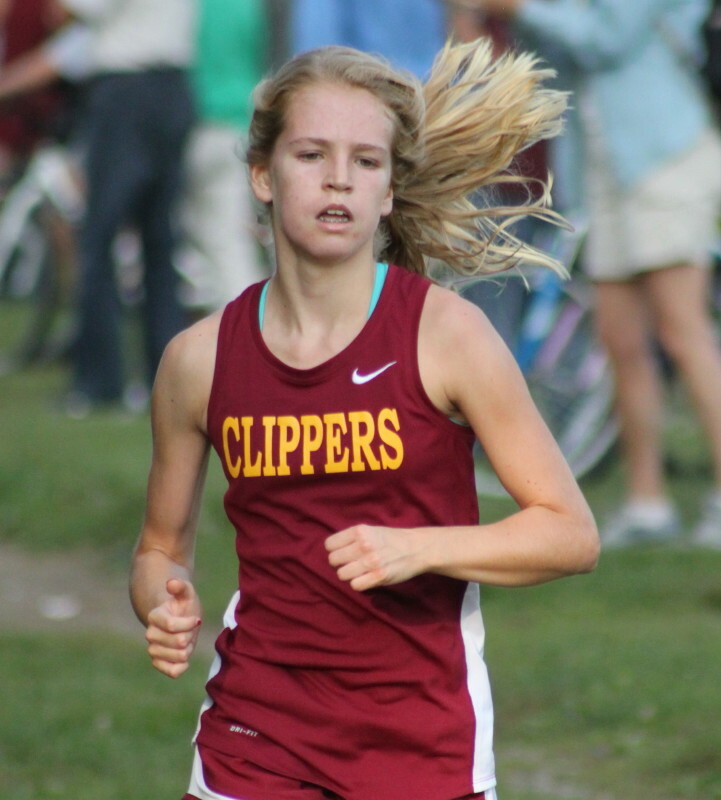 Newburyport’s Sarah Jacqz (8th) and Rachel Rikeman (9th) ended the NA streak of runners. 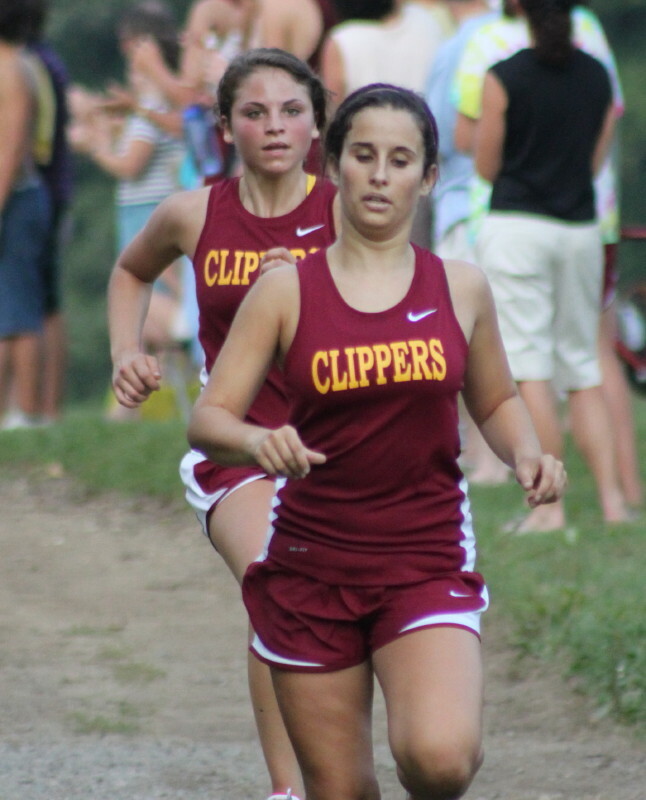 Kelly Conway (right) and Erin Carroll (left) take 2nd and 3rd. 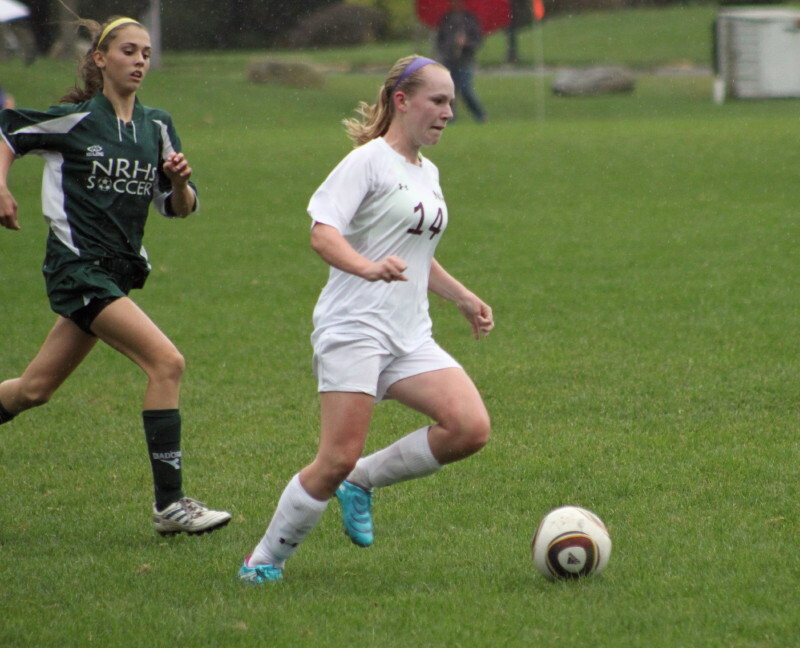 The Hamilton-Wenham Generals are Newburyport’s next opponent next Wednesday at Maudslay. 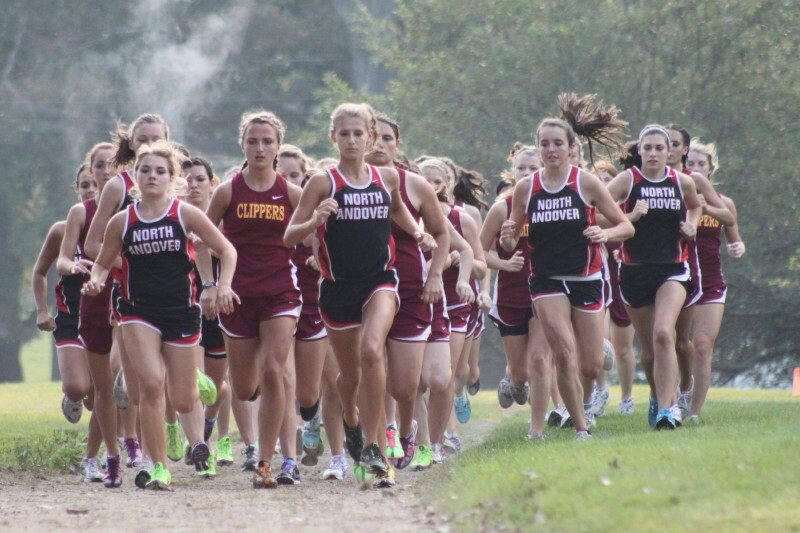 This was the first cross country meet I’ve been to at the state park. 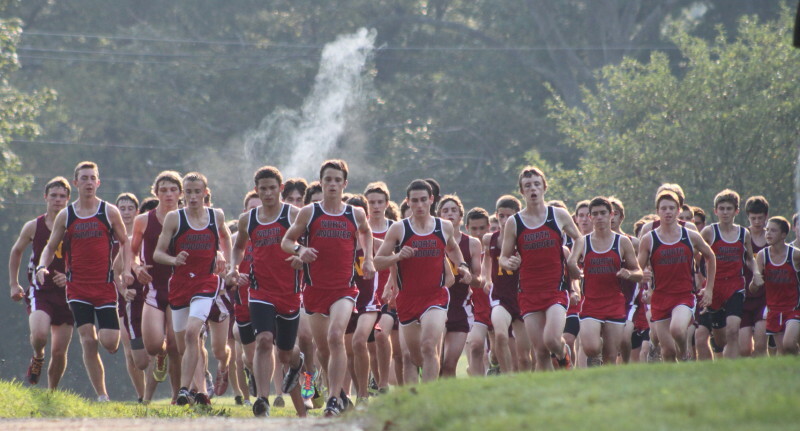 The temperature’s were probably too high for the runners’ liking but comfortable for those of us watching. 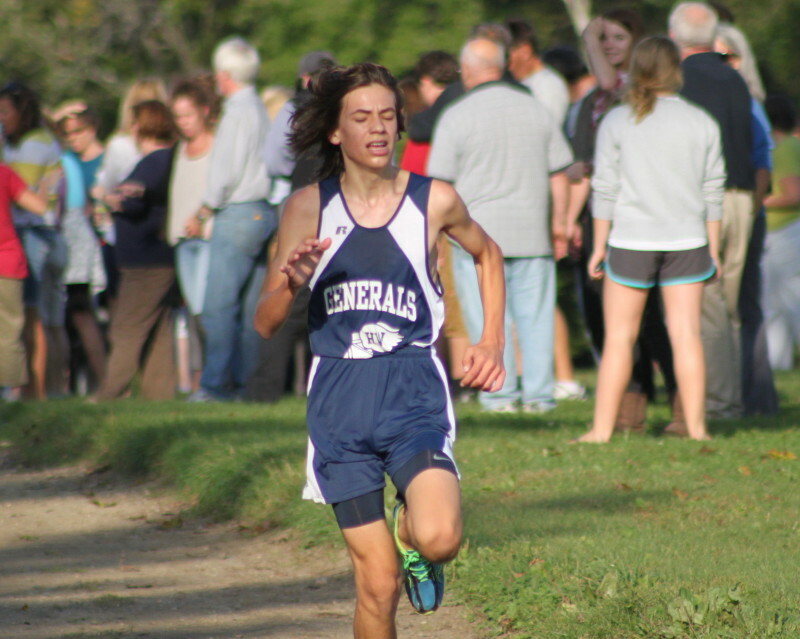 For some reason the meet started nearly an hour late but that just seemed to increase the interaction time among runners and among spectators. I was pleasantly surprised that bugs weren’t an issue. 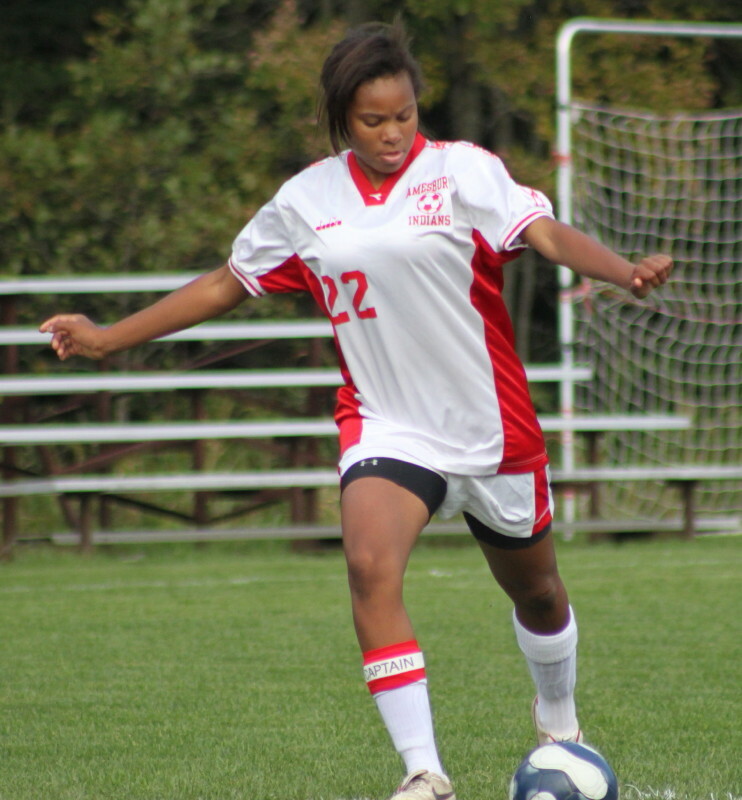 Clicking on any of the pictures enlarges them.